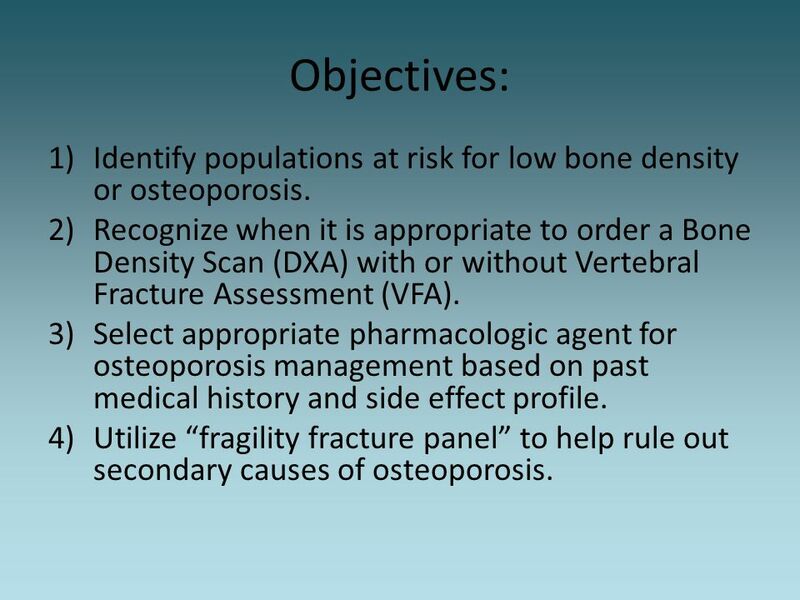 2 Objectives: Identify populations at risk for low bone density or osteoporosis. 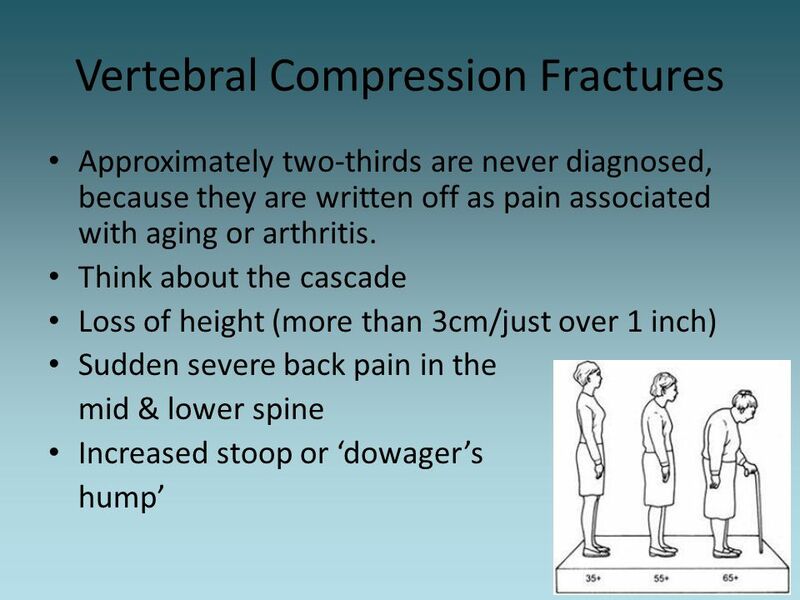 Recognize when it is appropriate to order a Bone Density Scan (DXA) with or without Vertebral Fracture Assessment (VFA). 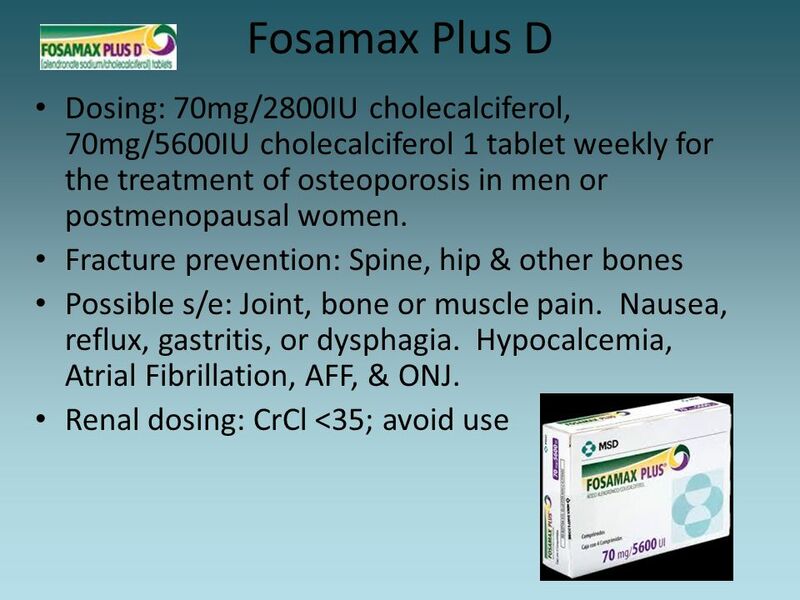 Select appropriate pharmacologic agent for osteoporosis management based on past medical history and side effect profile. 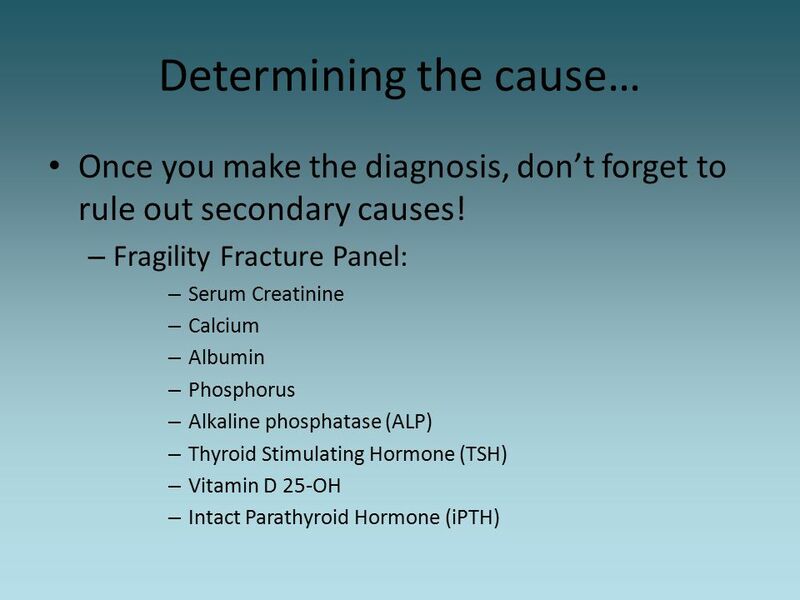 Utilize “fragility fracture panel” to help rule out secondary causes of osteoporosis. 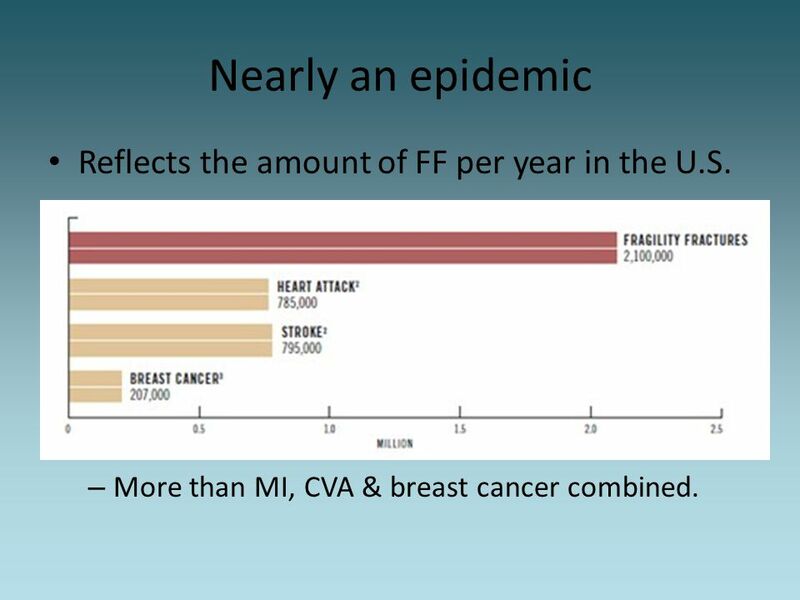 3 Nearly an epidemic Reflects the amount of FF per year in the U.S.
More than MI, CVA & breast cancer combined. 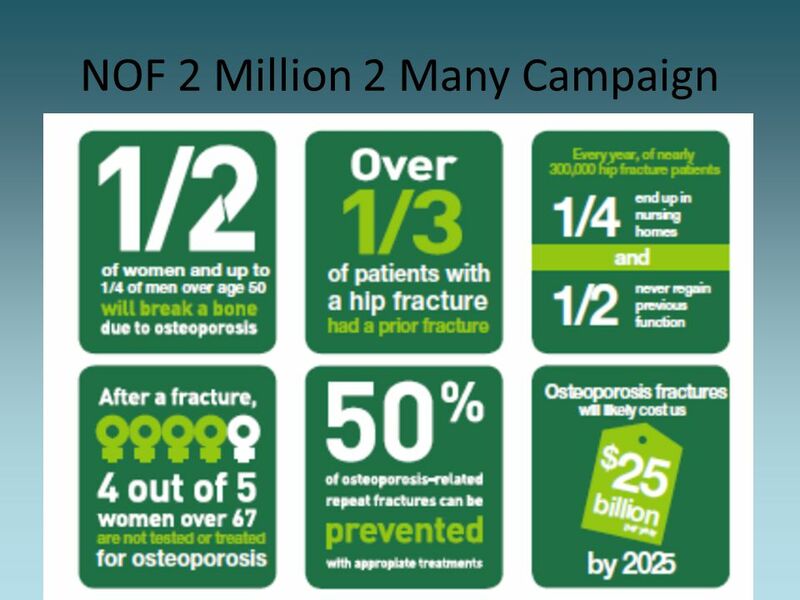 7 Cost of Osteoporosis Direct care expenditure from osteoporosis-related fractures exceeds $19 billion annually. 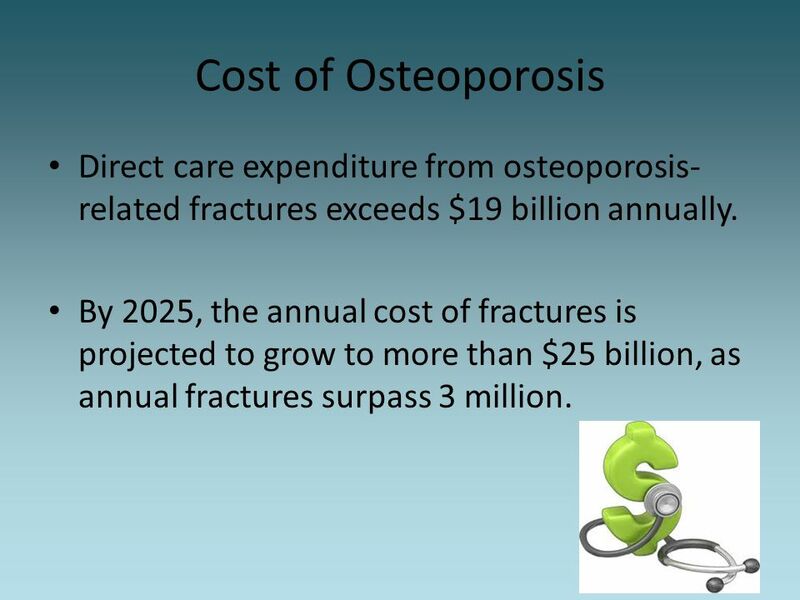 By 2025, the annual cost of fractures is projected to grow to more than $25 billion, as annual fractures surpass 3 million. 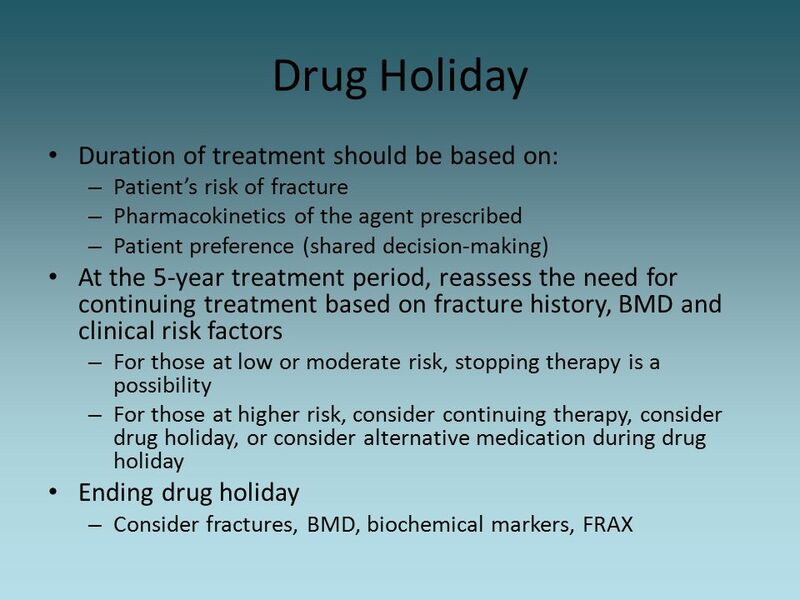 Approximately 80% of patients do not receive recommended osteoporosis care following a fragility fracture. 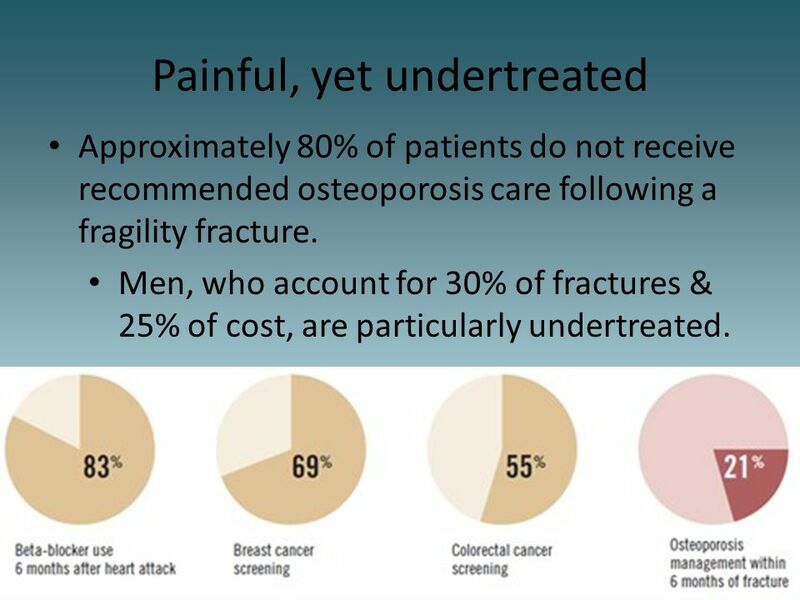 Men, who account for 30% of fractures & 25% of cost, are particularly undertreated. 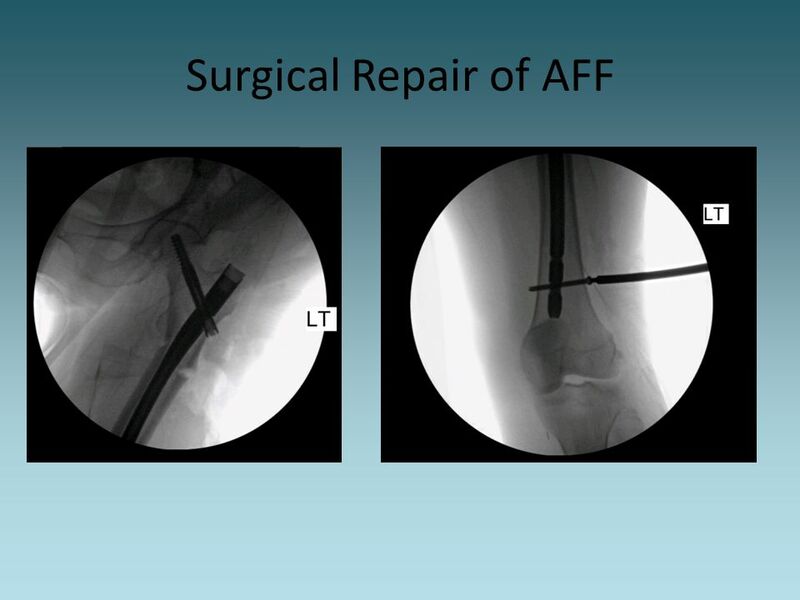 Nearly 25% of patients who suffer a hip fracture die within a year. Those who do survive experience significant morbidity, as many experience a loss of independence & may require long-term nursing home care. 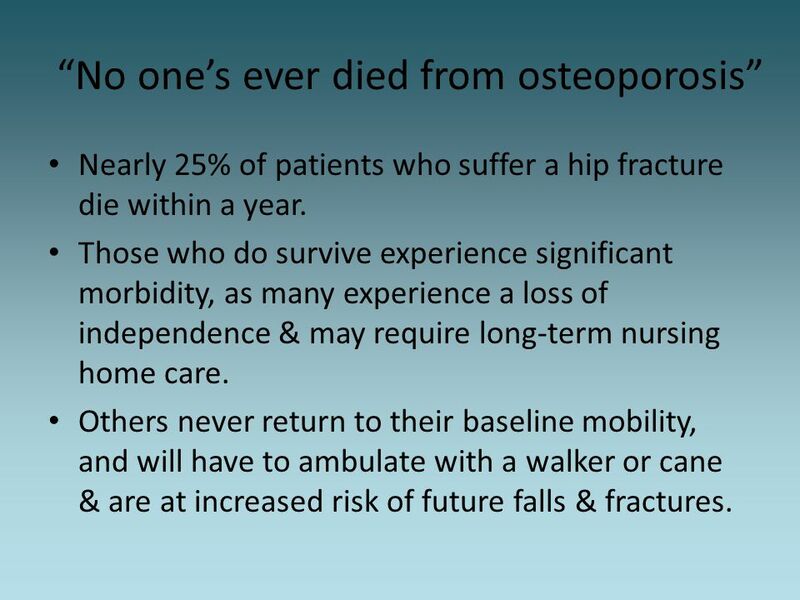 Others never return to their baseline mobility, and will have to ambulate with a walker or cane & are at increased risk of future falls & fractures. 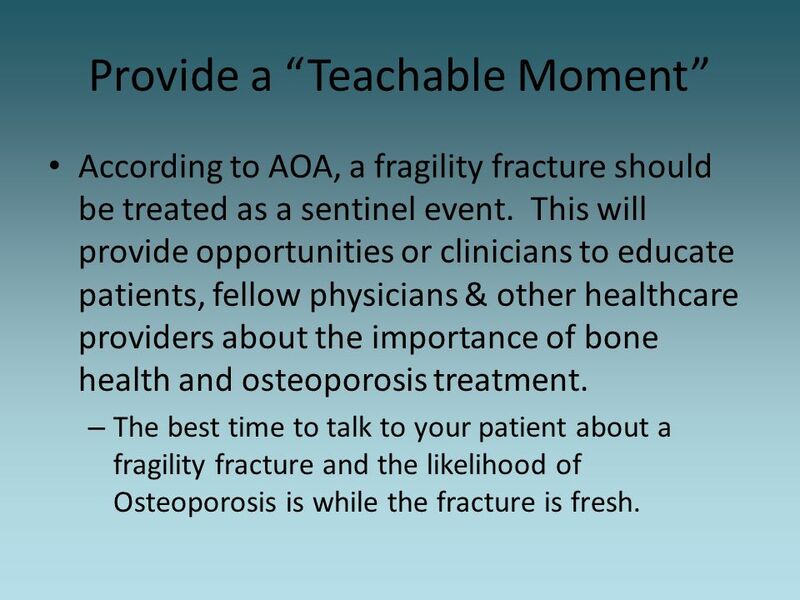 According to AOA, a fragility fracture should be treated as a sentinel event. 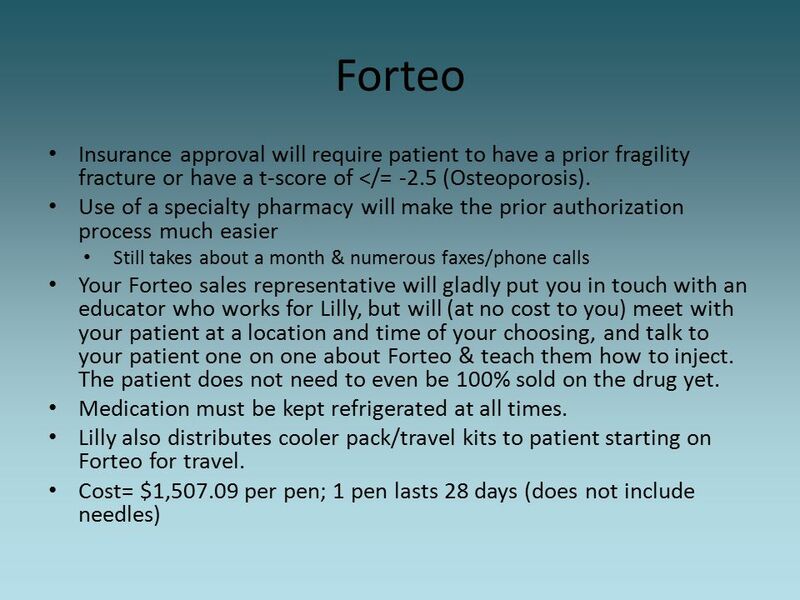 This will provide opportunities or clinicians to educate patients, fellow physicians & other healthcare providers about the importance of bone health and osteoporosis treatment. 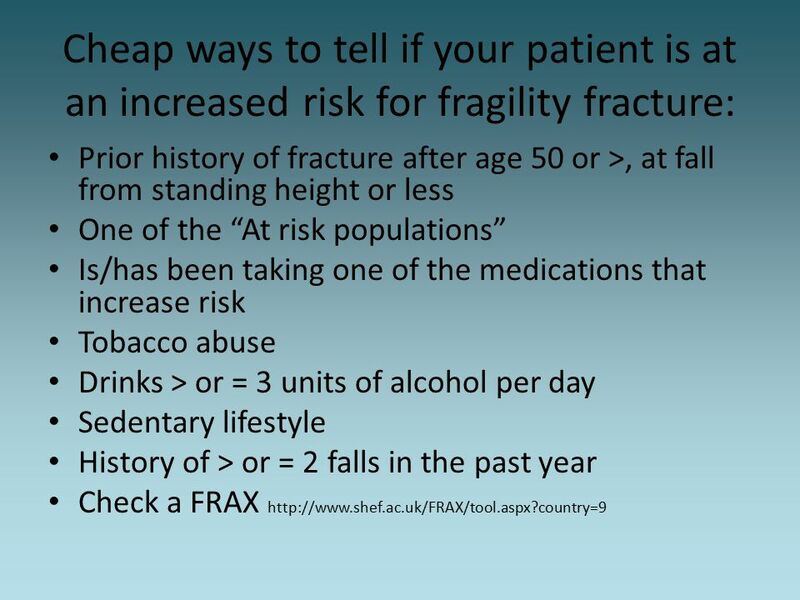 The best time to talk to your patient about a fragility fracture and the likelihood of Osteoporosis is while the fracture is fresh. 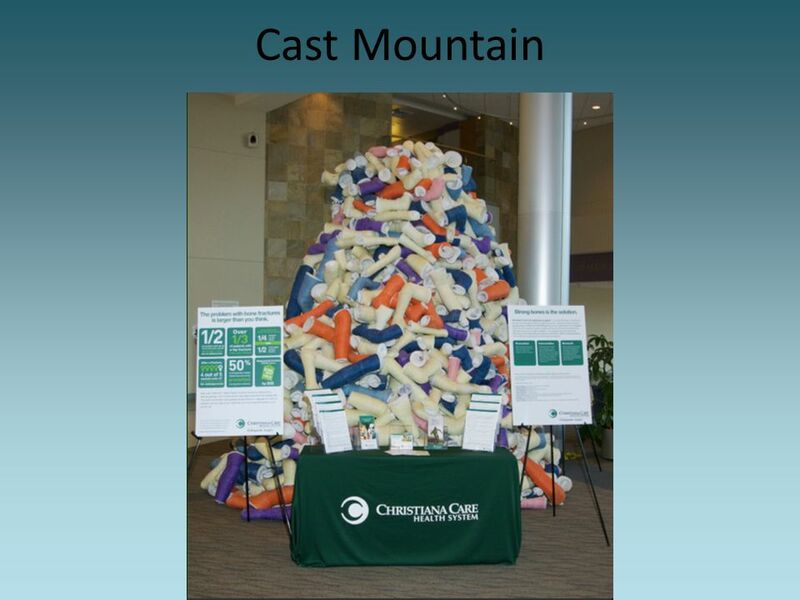 11 Fracture Cascade About 50% of people with one fracture due to Osteoporosis will have a repeat fracture. 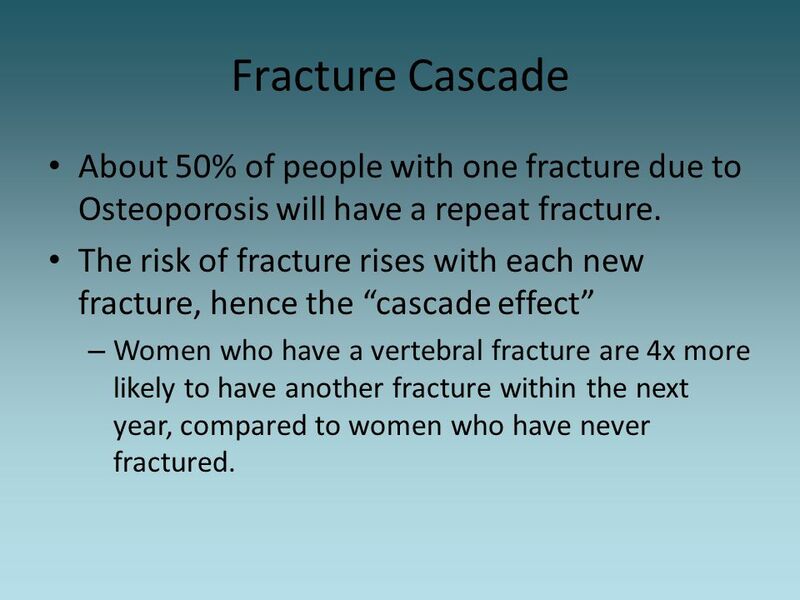 The risk of fracture rises with each new fracture, hence the “cascade effect” Women who have a vertebral fracture are 4x more likely to have another fracture within the next year, compared to women who have never fractured. 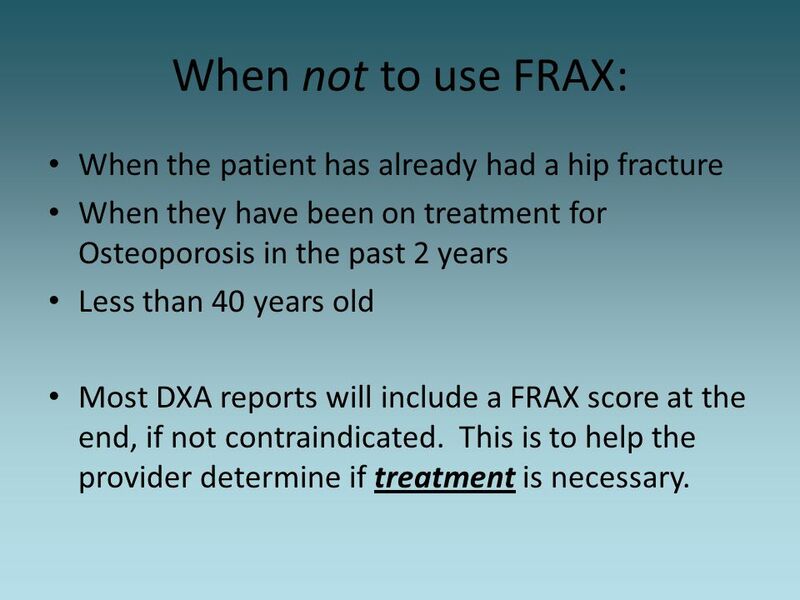 When they have been on treatment for Osteoporosis in the past 2 years Less than 40 years old Most DXA reports will include a FRAX score at the end, if not contraindicated. 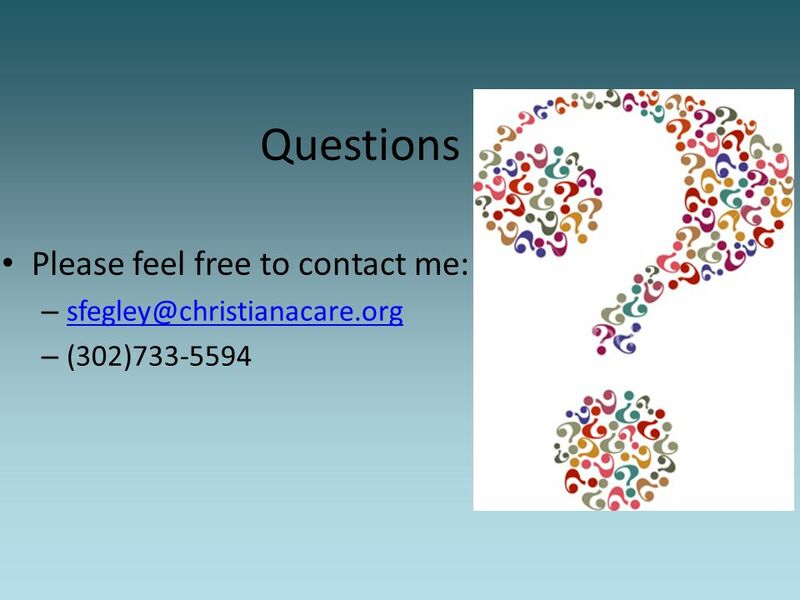 This is to help the provider determine if treatment is necessary. 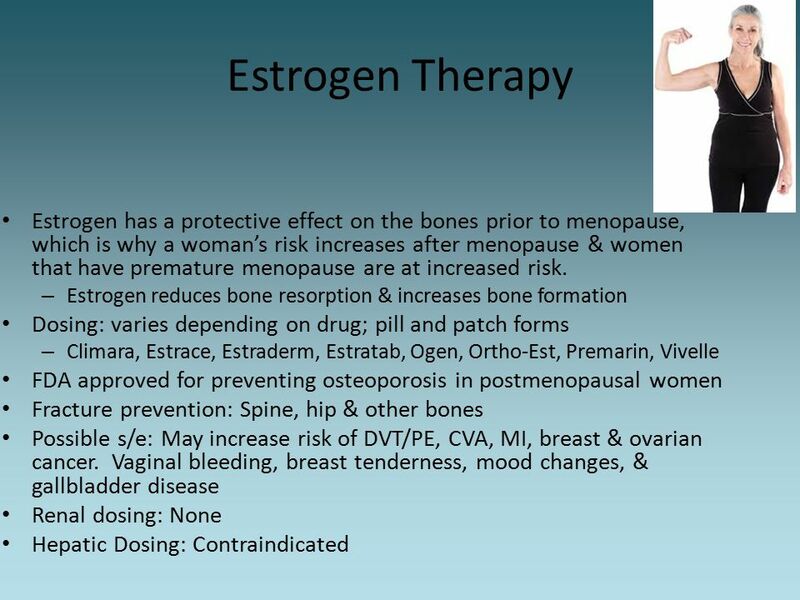 Women age 65 years and older and men age 70 and older. 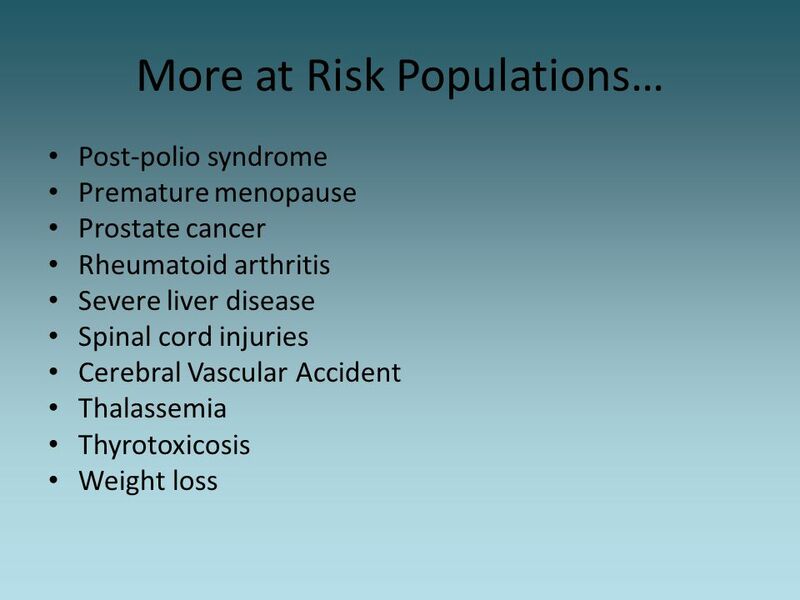 Women under 65 and men age about whom there is concern based on clinical risk factor profile or FRAX score. 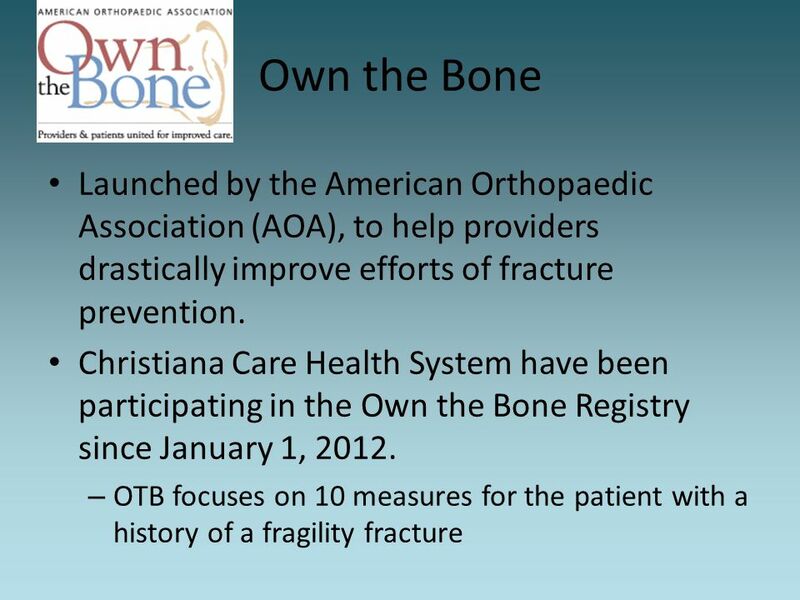 Women and men of any age who have suffered a low-impact fracture. 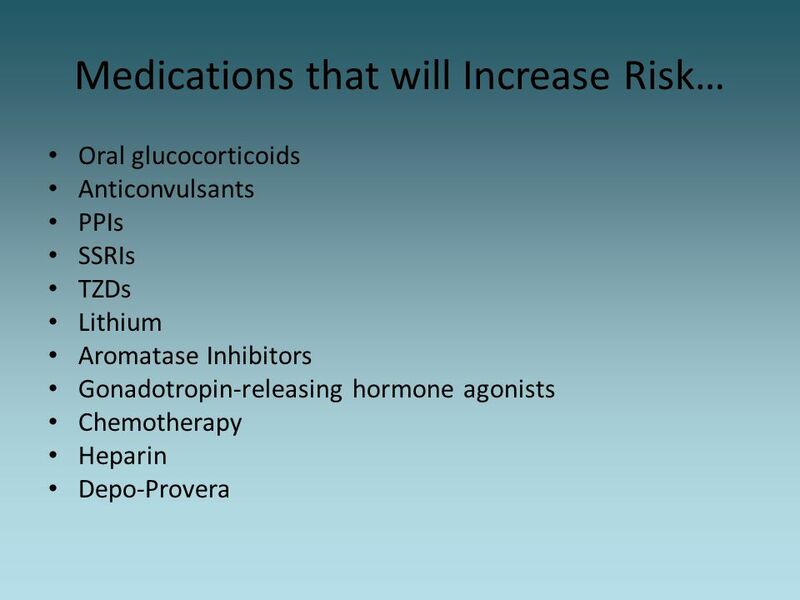 Women and men of any age who are at increased risk as a result of selected medical conditions or treatment with specific medications. 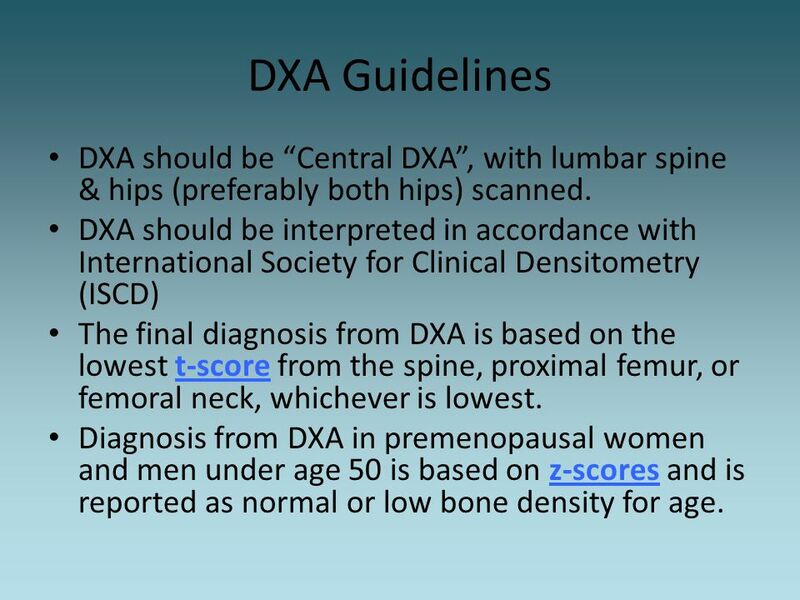 22 DXA Guidelines DXA should be “Central DXA”, with lumbar spine & hips (preferably both hips) scanned. 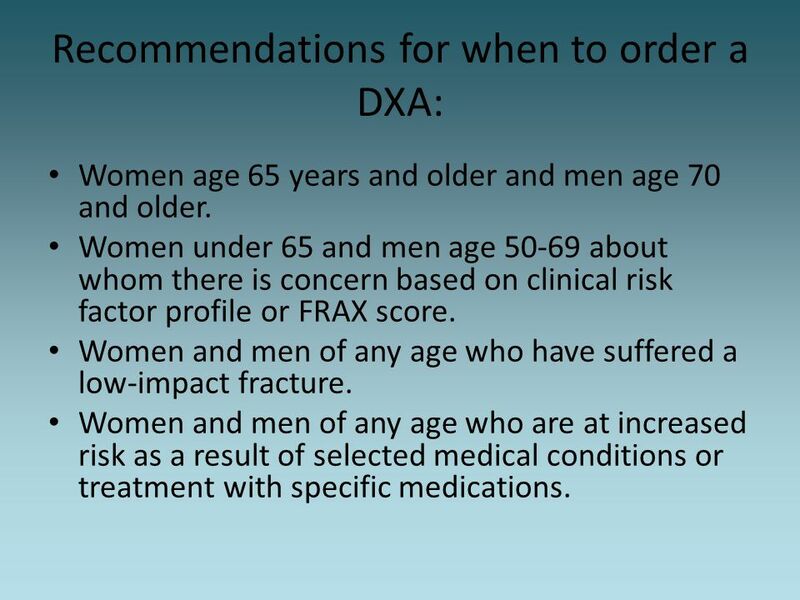 DXA should be interpreted in accordance with International Society for Clinical Densitometry (ISCD) The final diagnosis from DXA is based on the lowest t-score from the spine, proximal femur, or femoral neck, whichever is lowest. 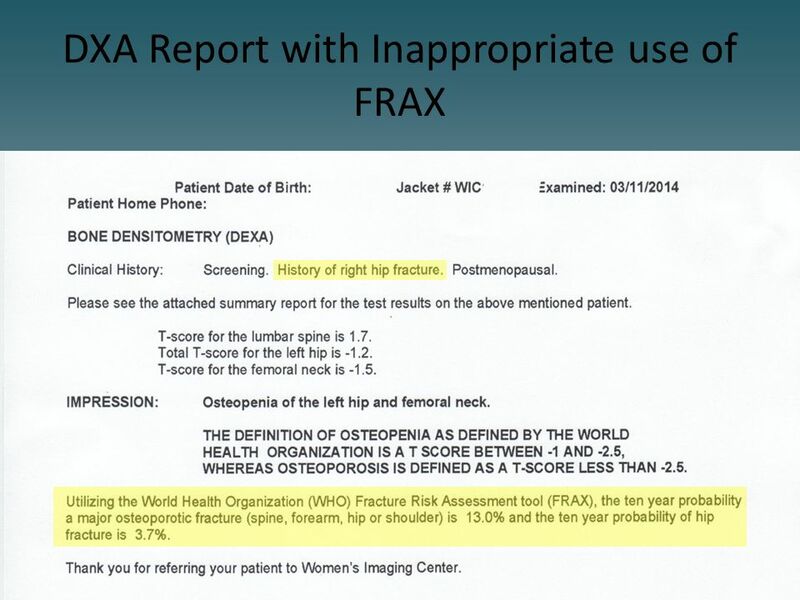 Diagnosis from DXA in premenopausal women and men under age 50 is based on z-scores and is reported as normal or low bone density for age. 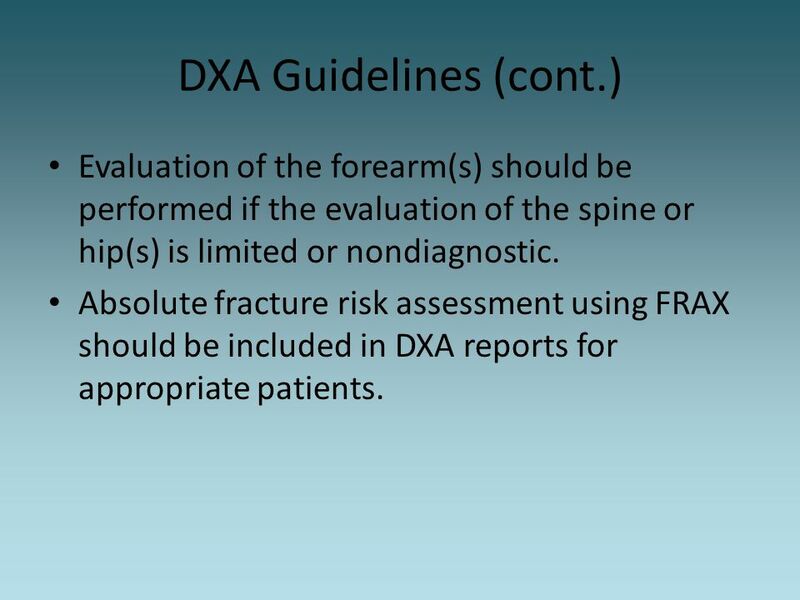 23 DXA Guidelines (cont.) 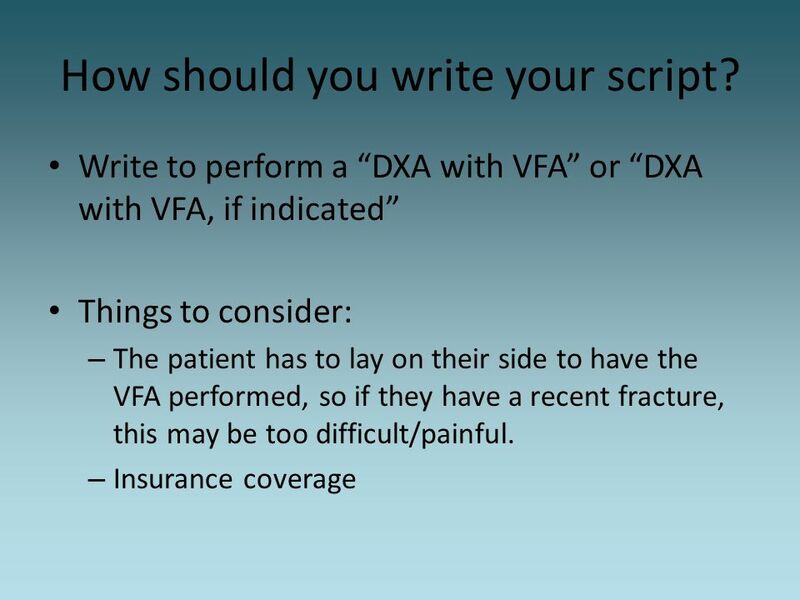 Evaluation of the forearm(s) should be performed if the evaluation of the spine or hip(s) is limited or nondiagnostic. 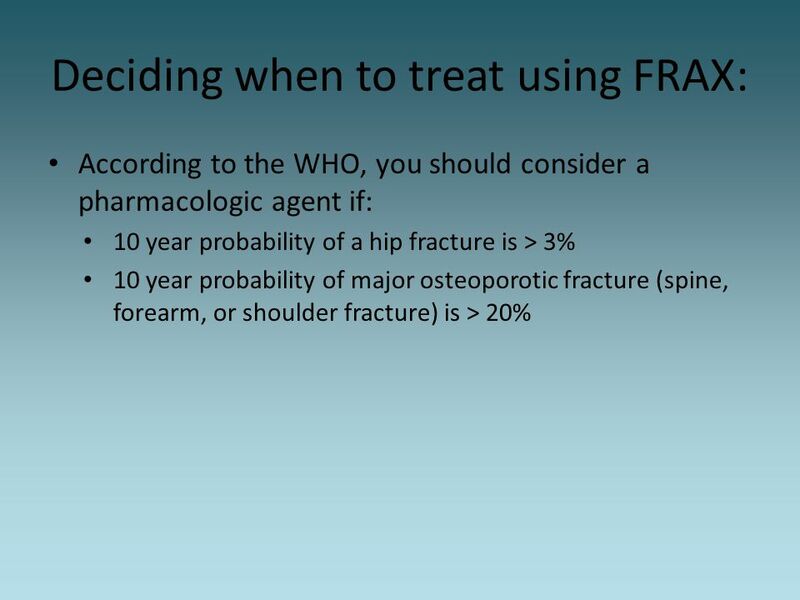 Absolute fracture risk assessment using FRAX should be included in DXA reports for appropriate patients. 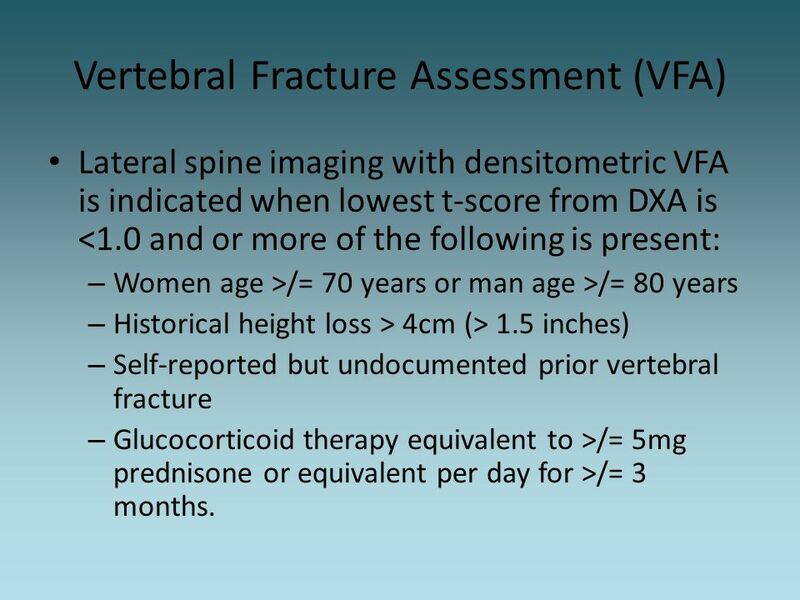 Lateral spine imaging with densitometric VFA is indicated when lowest t-score from DXA is <1.0 and or more of the following is present: Women age >/= 70 years or man age >/= 80 years Historical height loss > 4cm (> 1.5 inches) Self-reported but undocumented prior vertebral fracture Glucocorticoid therapy equivalent to >/= 5mg prednisone or equivalent per day for >/= 3 months. 25 How should you write your script? Eyes- Sclera Mouth- Teeth~ In OI can be normal or soft & translucent. 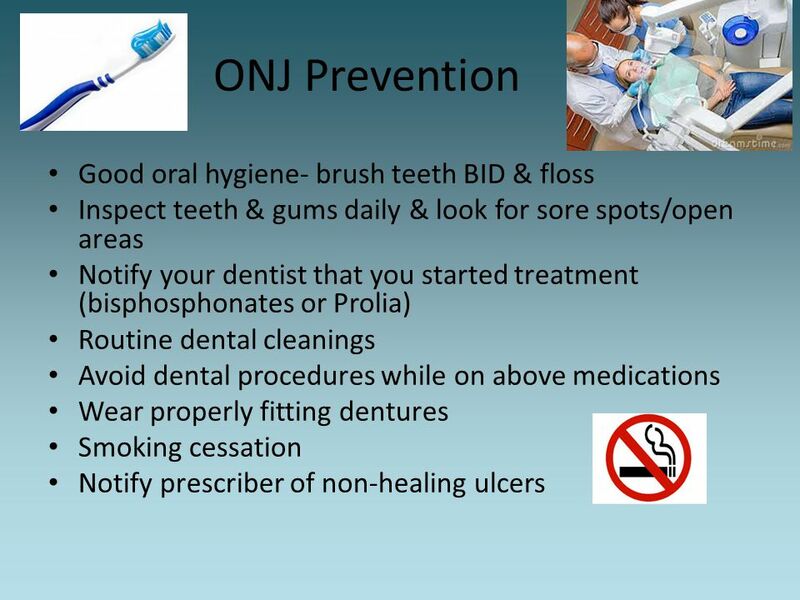 Also if you are considering bisphosphonate or Prolia therapy you want to evaluate their dentition to determine increased risk for ONJ. 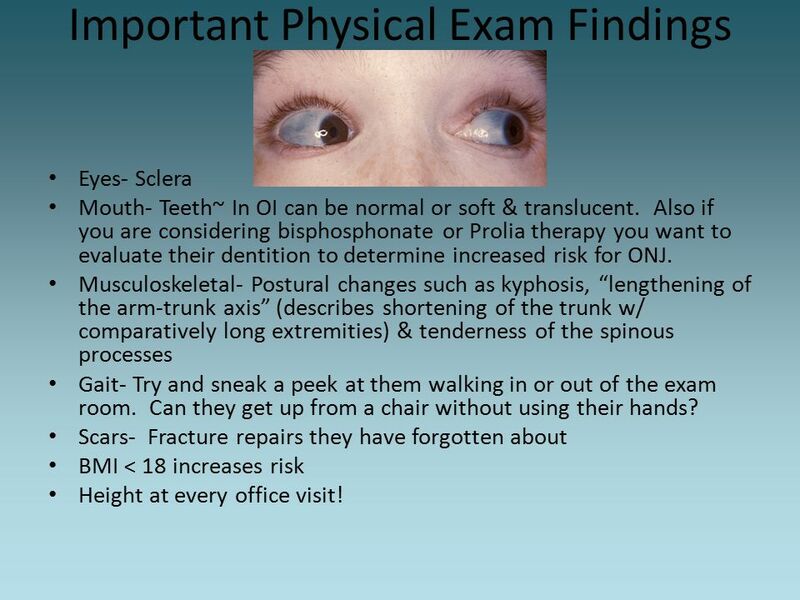 Musculoskeletal- Postural changes such as kyphosis, “lengthening of the arm-trunk axis” (describes shortening of the trunk w/ comparatively long extremities) & tenderness of the spinous processes Gait- Try and sneak a peek at them walking in or out of the exam room. Can they get up from a chair without using their hands? 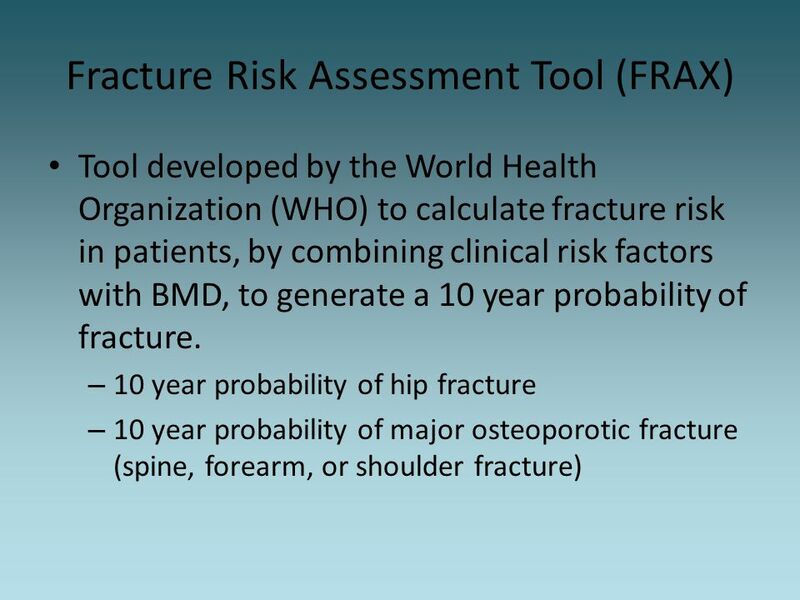 Scars- Fracture repairs they have forgotten about BMI < 18 increases risk Height at every office visit! 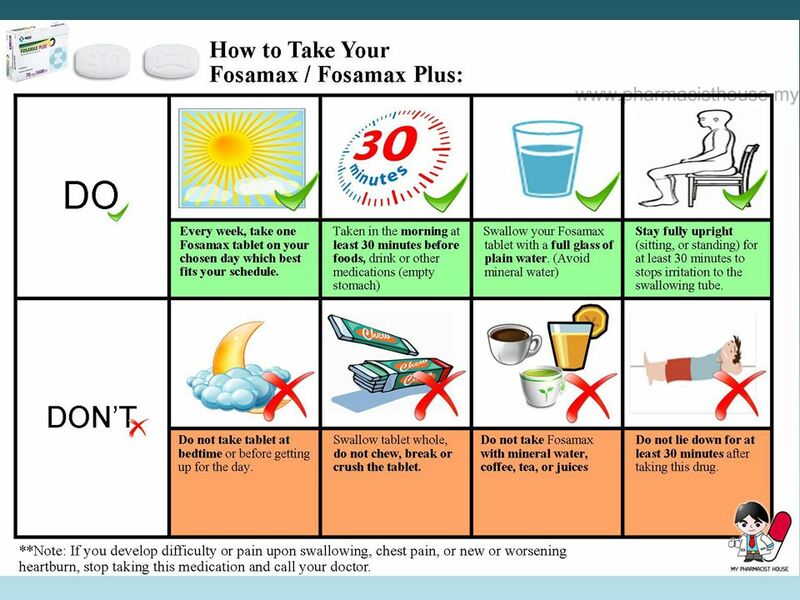 Self-Care at home: Rest Pain relief with NSAIDs May also need muscle relaxants Ice for 20 minutes every 60 minutes for the first week, then can do heat or ice, which ever feels better. Physical therapy, when permitted~ with emphasis on stretching & strengthening program to decrease risk for further osteoporosis and strengthen muscles supporting the back. 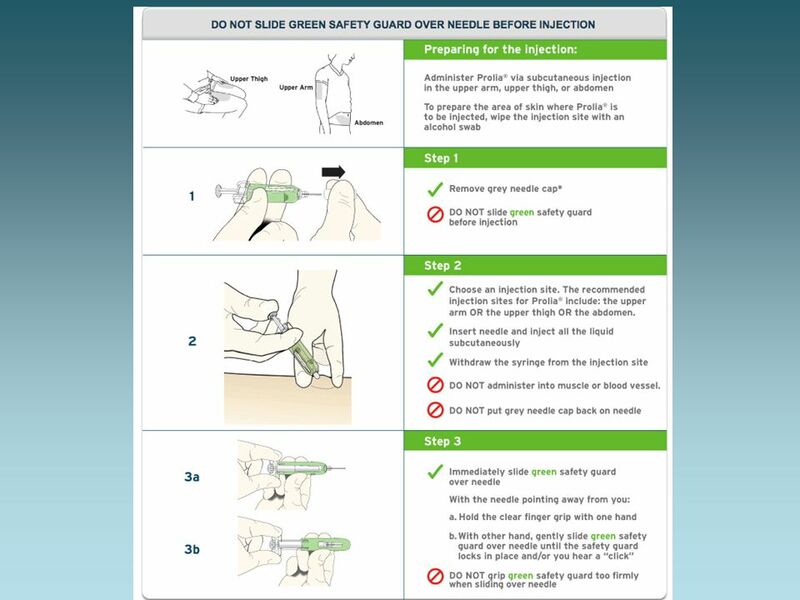 Hospital Admission: Inpatient treatment dependant upon pain control, weakness, ambulatory dysfunction, urinary retention, & cauda equina syndrome. TLSO (Thoracolumbosacral Orthosis) brace as needed, when out of bed for comfort. 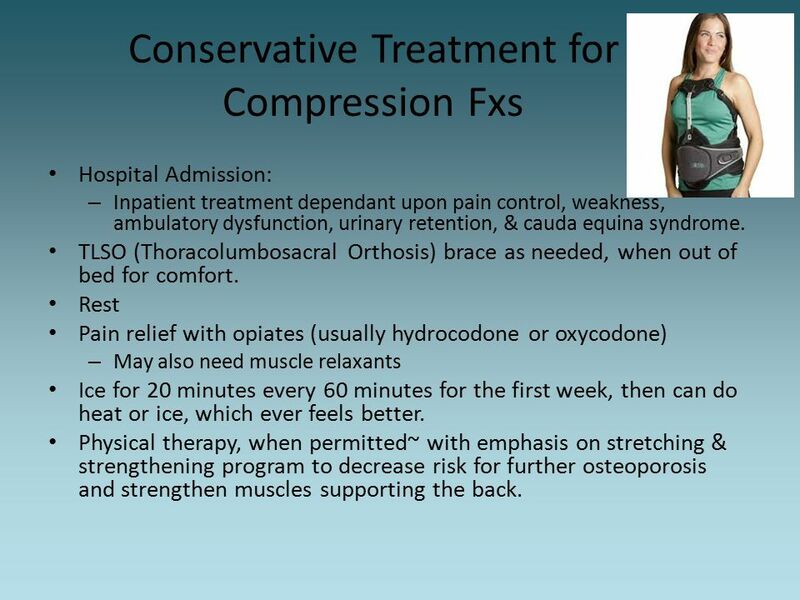 Rest Pain relief with opiates (usually hydrocodone or oxycodone) May also need muscle relaxants Ice for 20 minutes every 60 minutes for the first week, then can do heat or ice, which ever feels better. 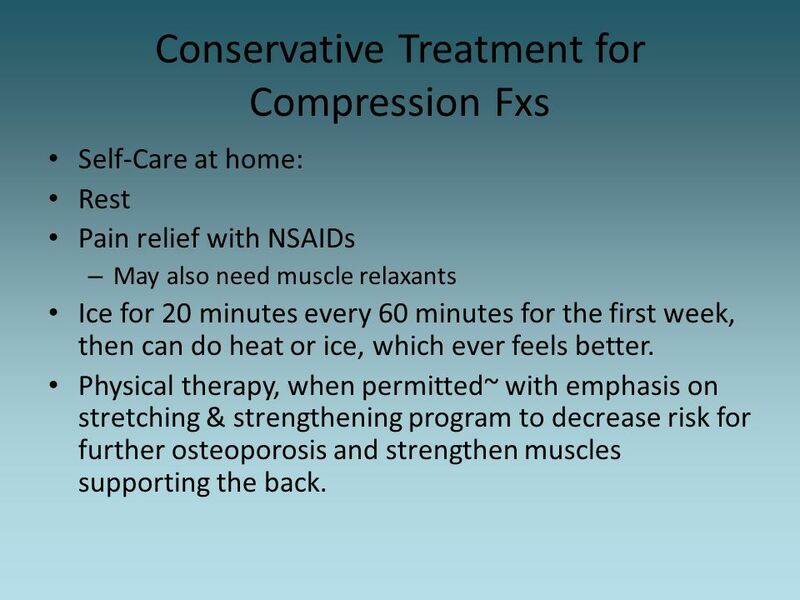 Physical therapy, when permitted~ with emphasis on stretching & strengthening program to decrease risk for further osteoporosis and strengthen muscles supporting the back. 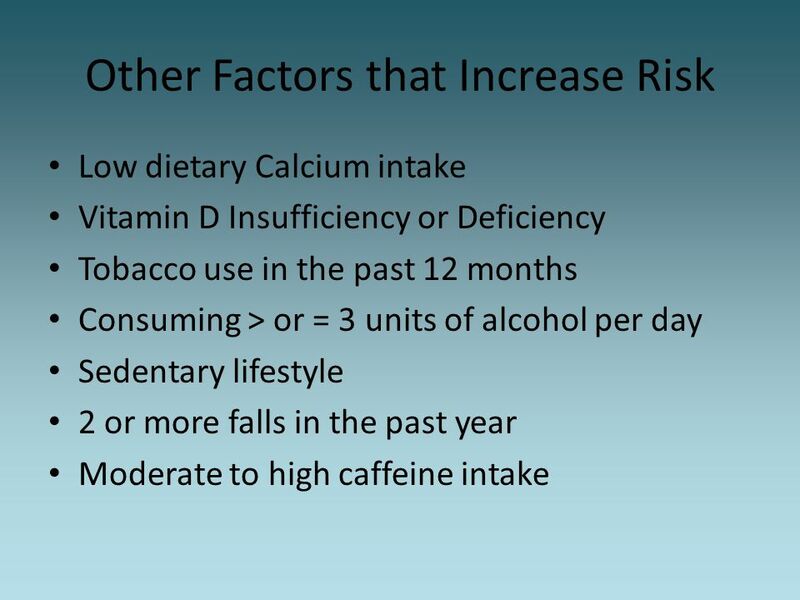 Vitamin D supplementation Weight-bearing & muscle-strengthening exercise Fall prevention education Smoking cessation Limiting excessive alcohol intake Pharmacotherapy Ordering DXA Physician referral letter to report the patient’s fragility fracture, risk factors, & recommendations for treatment. 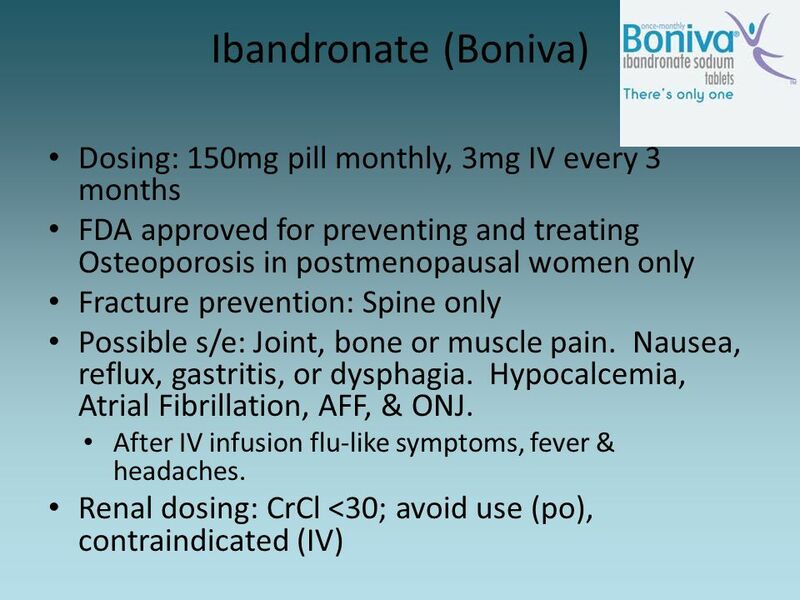 Patient education latter to explain bone health risk factors & recommendations for treatment. 39 Which is the best Calcium? 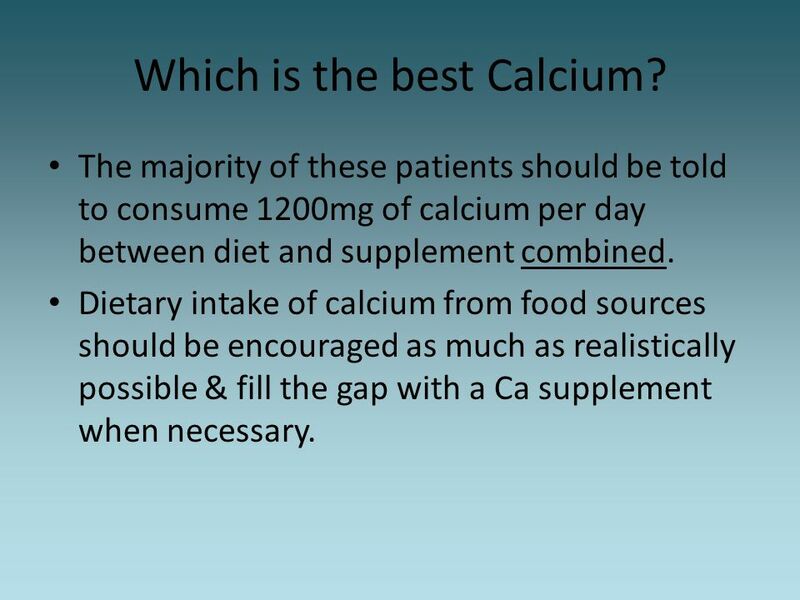 The majority of these patients should be told to consume 1200mg of calcium per day between diet and supplement combined. 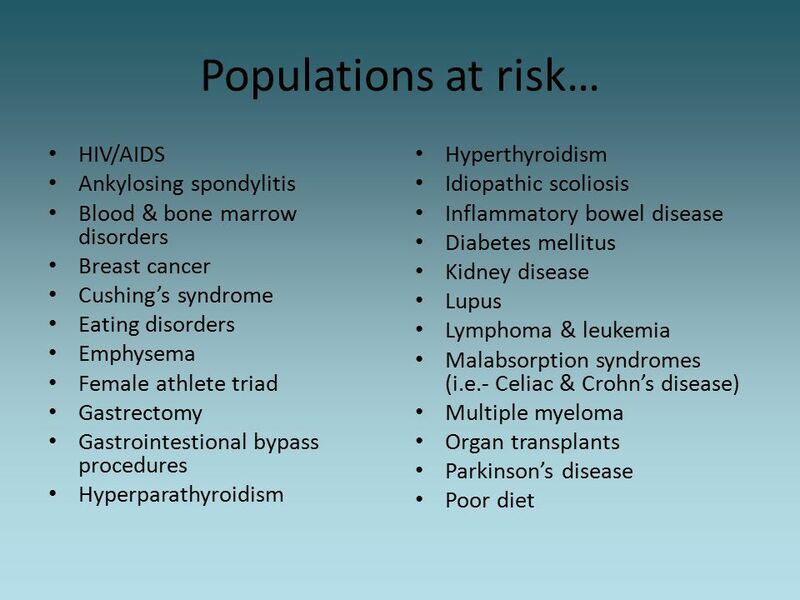 Dietary intake of calcium from food sources should be encouraged as much as realistically possible & fill the gap with a Ca supplement when necessary. Lowfat & non-fat dairy products are high in calcium while certain green vegetables and other foods contain calcium in smaller amounts. 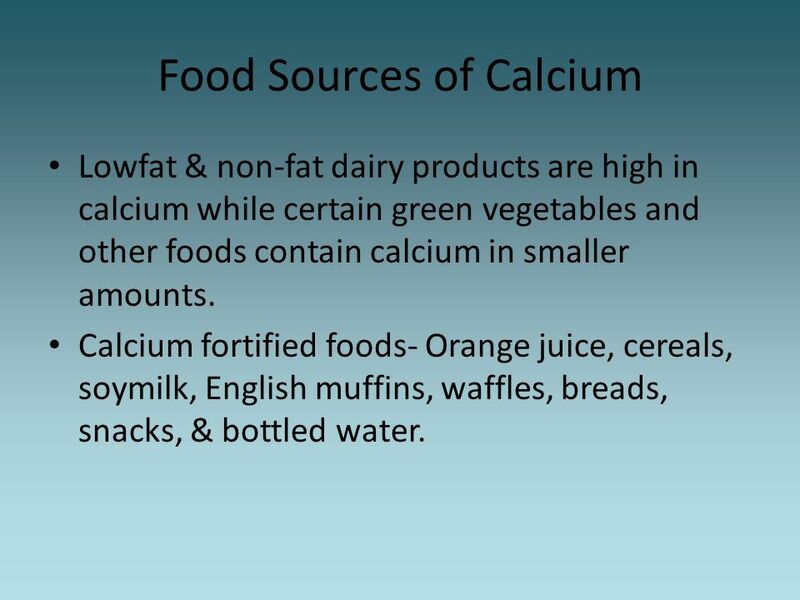 Calcium fortified foods- Orange juice, cereals, soymilk, English muffins, waffles, breads, snacks, & bottled water. 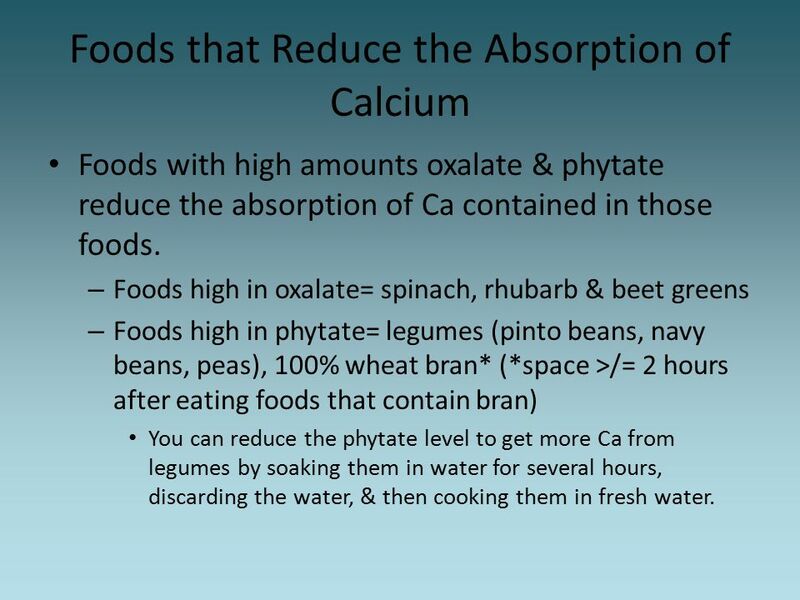 Foods with high amounts oxalate & phytate reduce the absorption of Ca contained in those foods. Foods high in oxalate= spinach, rhubarb & beet greens Foods high in phytate= legumes (pinto beans, navy beans, peas), 100% wheat bran* (*space >/= 2 hours after eating foods that contain bran) You can reduce the phytate level to get more Ca from legumes by soaking them in water for several hours, discarding the water, & then cooking them in fresh water. 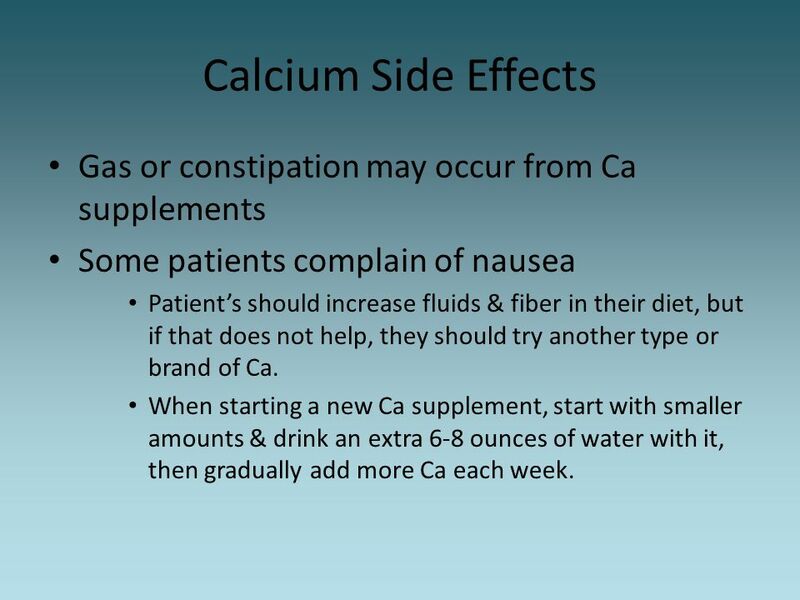 Some patients complain of nausea Patient’s should increase fluids & fiber in their diet, but if that does not help, they should try another type or brand of Ca. When starting a new Ca supplement, start with smaller amounts & drink an extra 6-8 ounces of water with it, then gradually add more Ca each week. 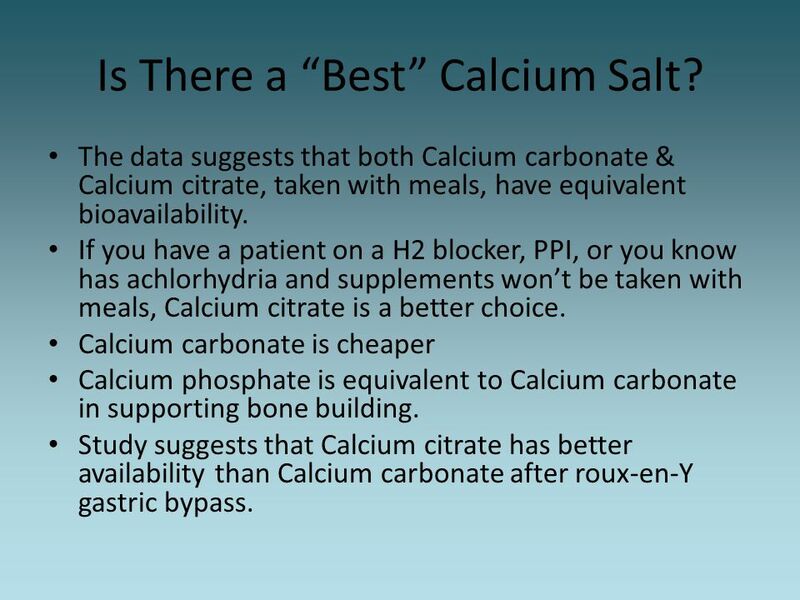 44 Is There a “Best” Calcium Salt? 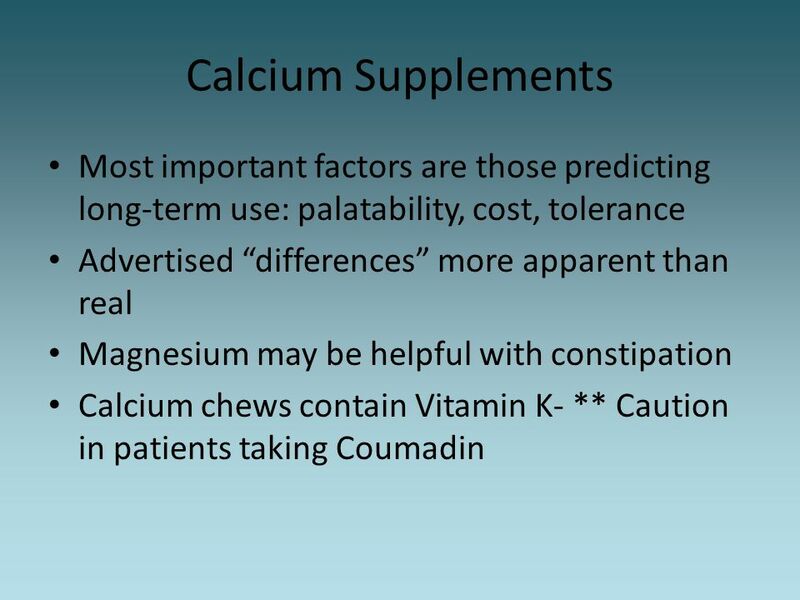 The data suggests that both Calcium carbonate & Calcium citrate, taken with meals, have equivalent bioavailability. 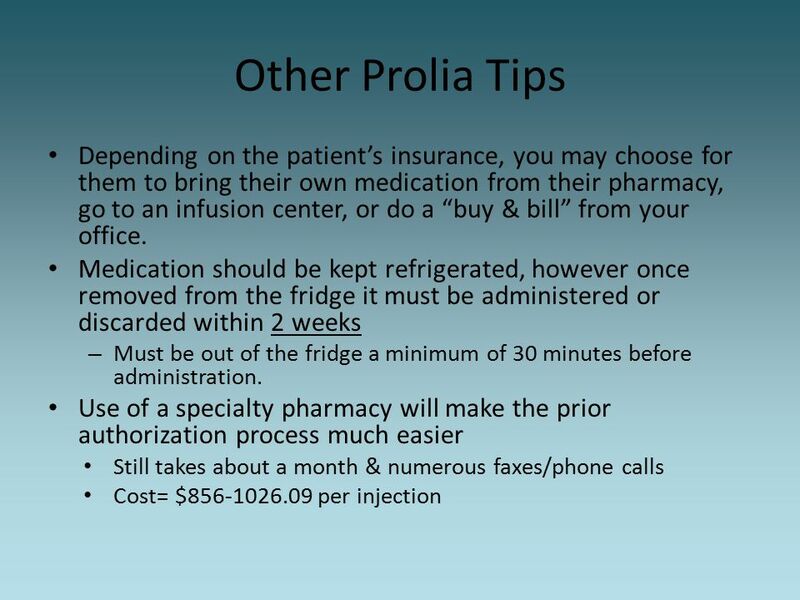 If you have a patient on a H2 blocker, PPI, or you know has achlorhydria and supplements won’t be taken with meals, Calcium citrate is a better choice. 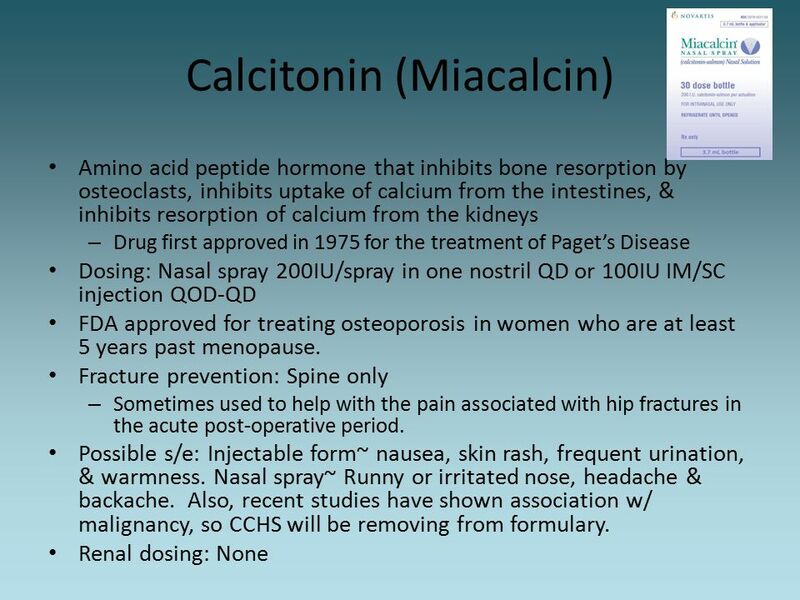 Calcium carbonate is cheaper Calcium phosphate is equivalent to Calcium carbonate in supporting bone building. 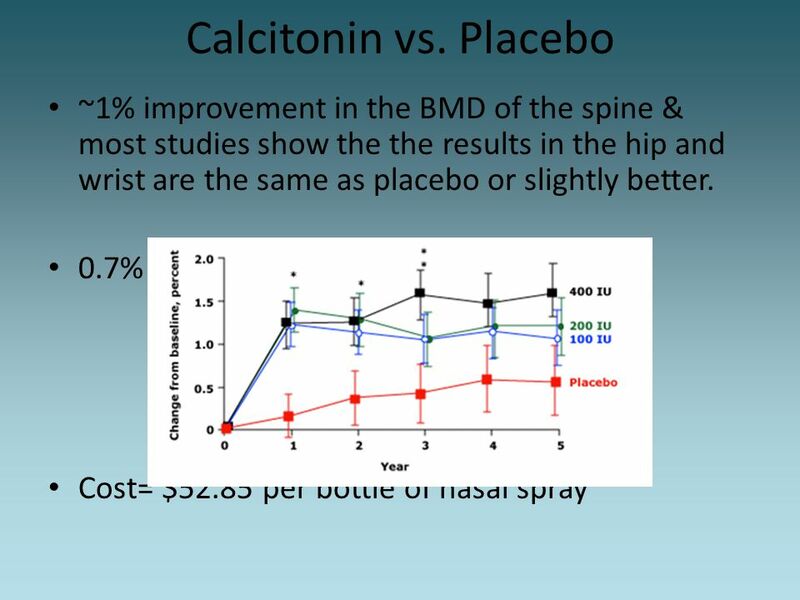 Study suggests that Calcium citrate has better availability than Calcium carbonate after roux-en-Y gastric bypass. 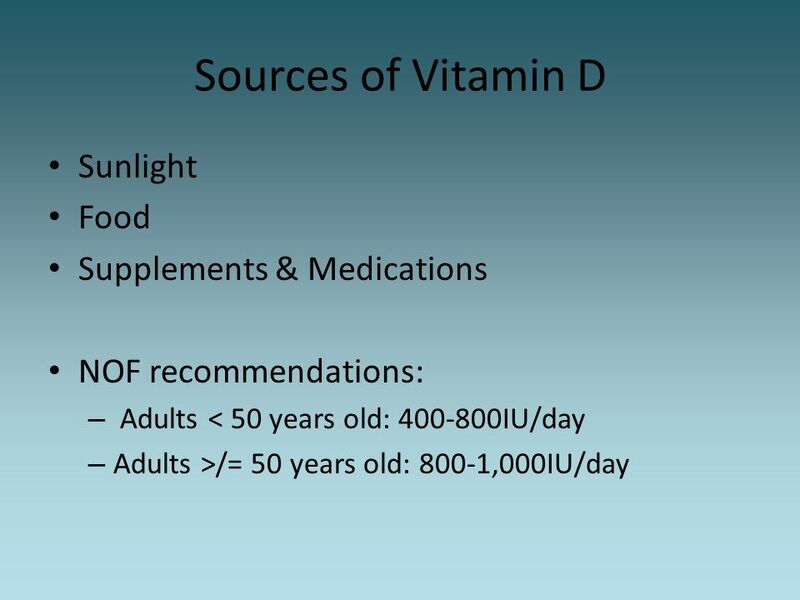 46 Why is Vitamin D so Important? 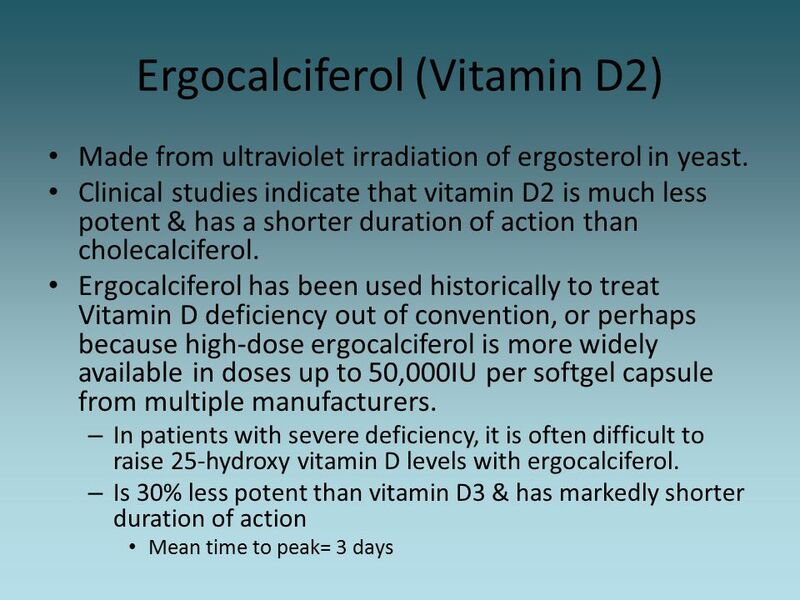 Vitamin D is essential for adequate gastrointestinal absorption of calcium. 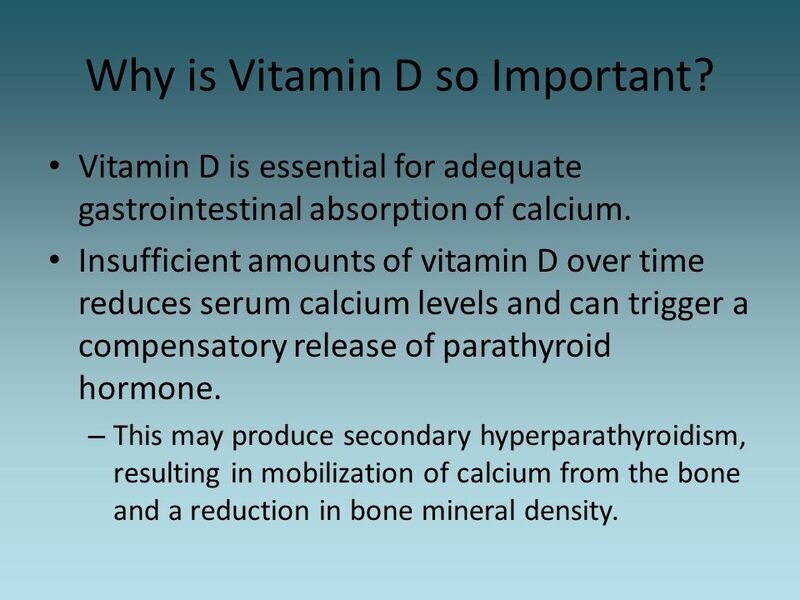 Insufficient amounts of vitamin D over time reduces serum calcium levels and can trigger a compensatory release of parathyroid hormone. 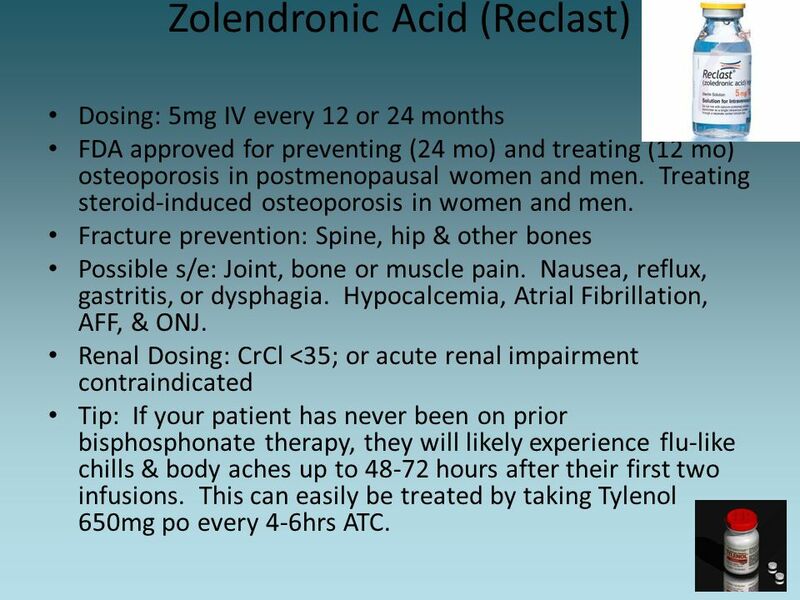 This may produce secondary hyperparathyroidism, resulting in mobilization of calcium from the bone and a reduction in bone mineral density. 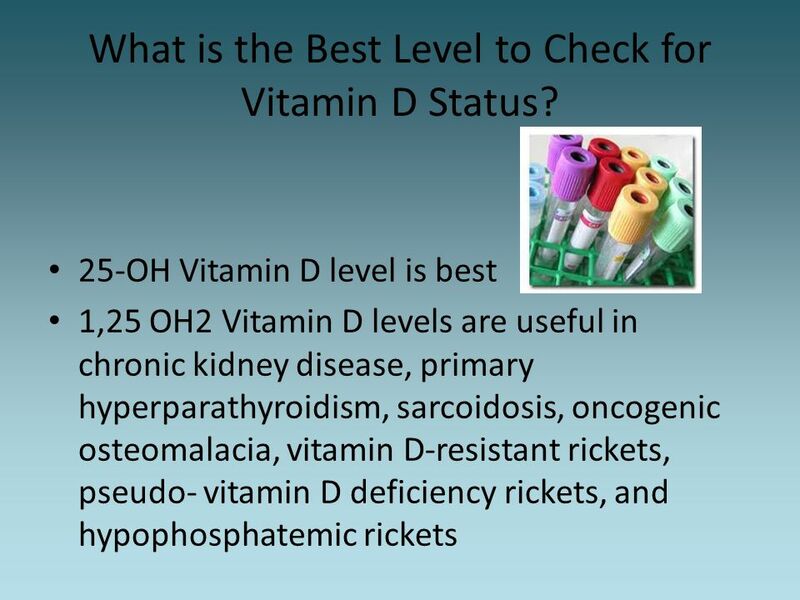 47 What is the Best Level to Check for Vitamin D Status? 48 What Do the Results Mean? 51 Sunlight Solar ultraviolet B photons are absorbed by 7-dehydrocholesterol in the skin, leading to its transformation to previtamin D3, which is rapidly converted to vitamin D3. 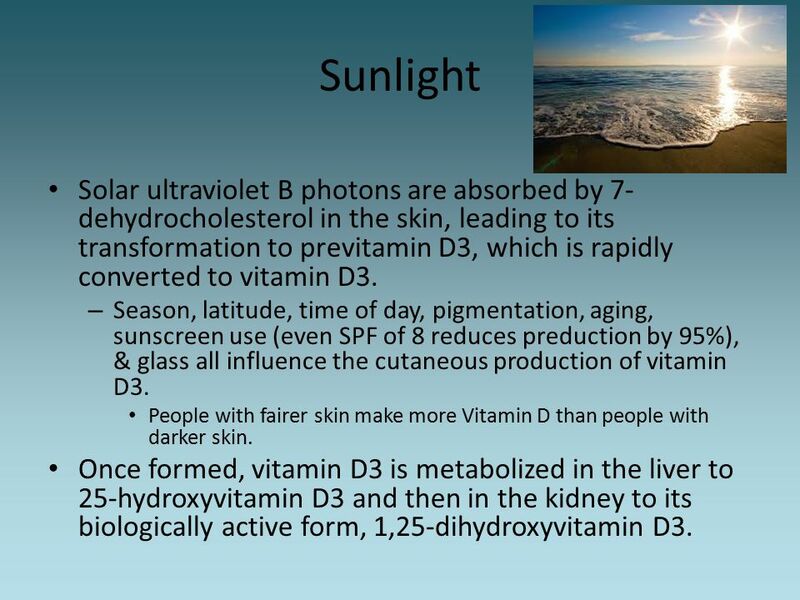 Season, latitude, time of day, pigmentation, aging, sunscreen use (even SPF of 8 reduces preduction by 95%), & glass all influence the cutaneous production of vitamin D3. 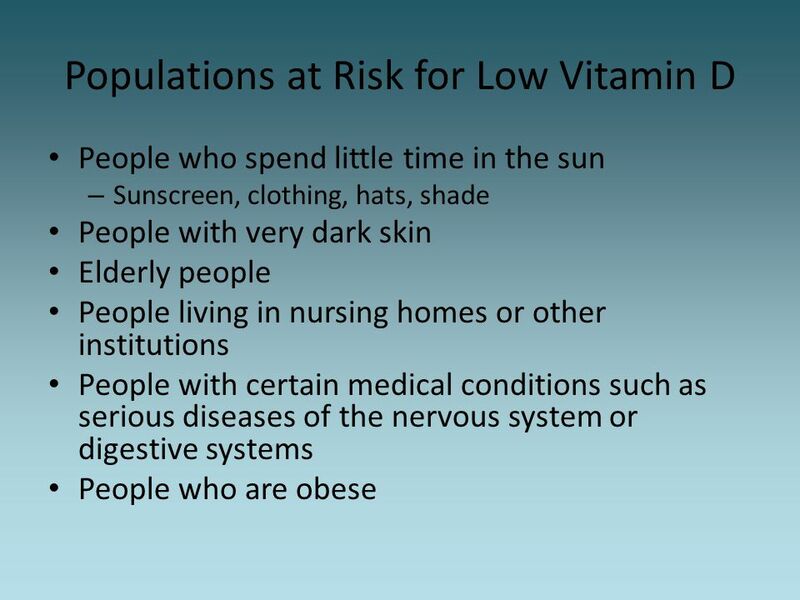 People with fairer skin make more Vitamin D than people with darker skin. Once formed, vitamin D3 is metabolized in the liver to 25-hydroxyvitamin D3 and then in the kidney to its biologically active form, 1,25-dihydroxyvitamin D3. 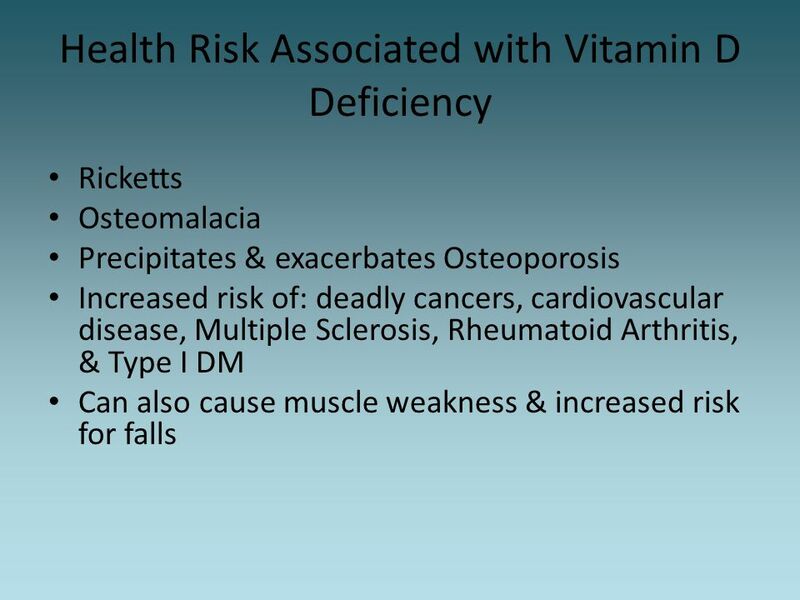 It is extremely difficult to get all the Vitamin D you need from diet alone. 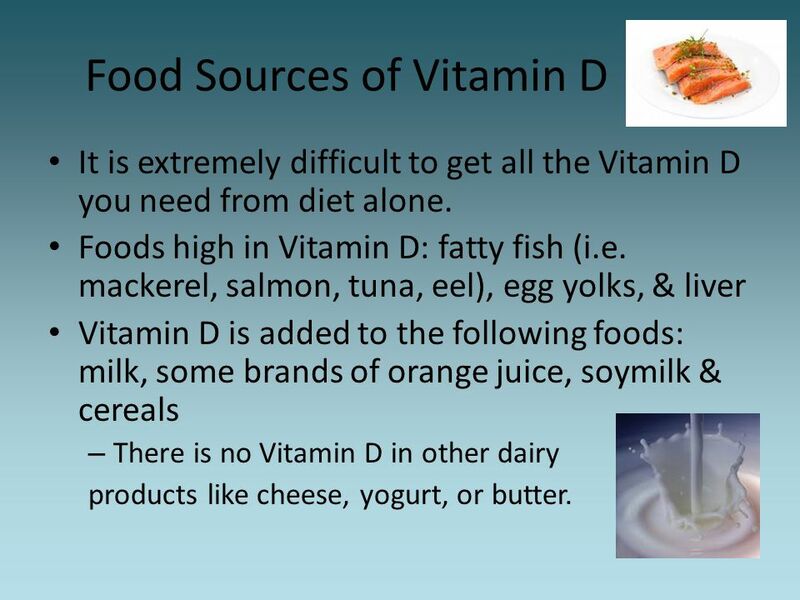 Foods high in Vitamin D: fatty fish (i.e. mackerel, salmon, tuna, eel), egg yolks, & liver Vitamin D is added to the following foods: milk, some brands of orange juice, soymilk & cereals There is no Vitamin D in other dairy products like cheese, yogurt, or butter. Fat soluble; made from irradiation of 7-dehydrocholesterol from lanolin & the chemical conversion of cholesterol. 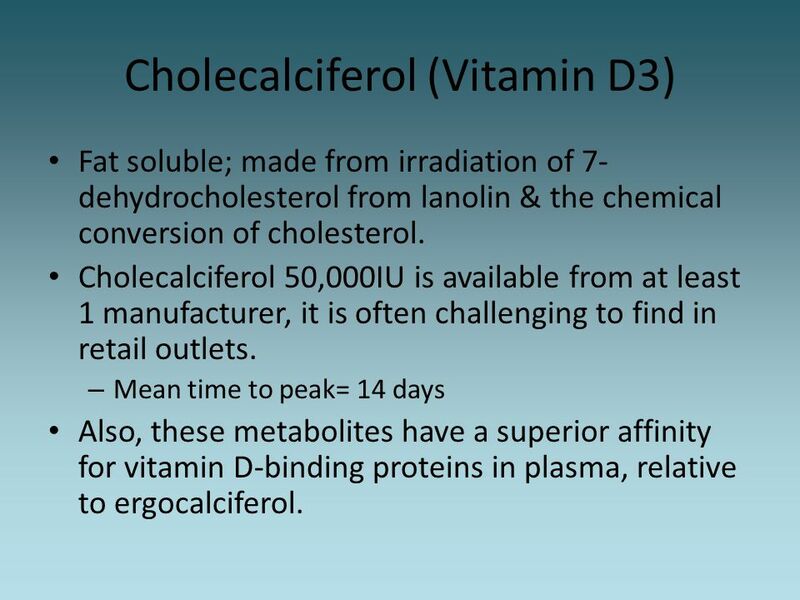 Cholecalciferol 50,000IU is available from at least 1 manufacturer, it is often challenging to find in retail outlets. Mean time to peak= 14 days Also, these metabolites have a superior affinity for vitamin D-binding proteins in plasma, relative to ergocalciferol. 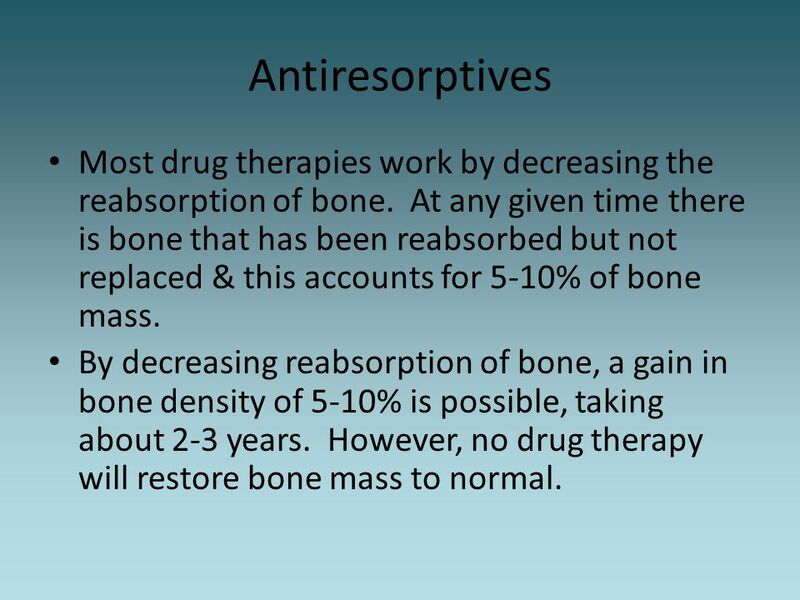 58 Antiresorptives Most drug therapies work by decreasing the reabsorption of bone. 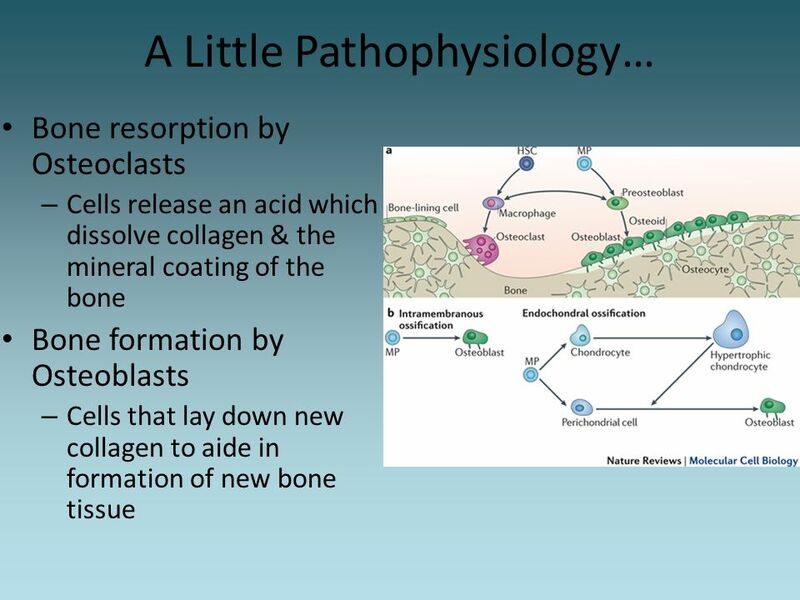 At any given time there is bone that has been reabsorbed but not replaced & this accounts for 5-10% of bone mass. 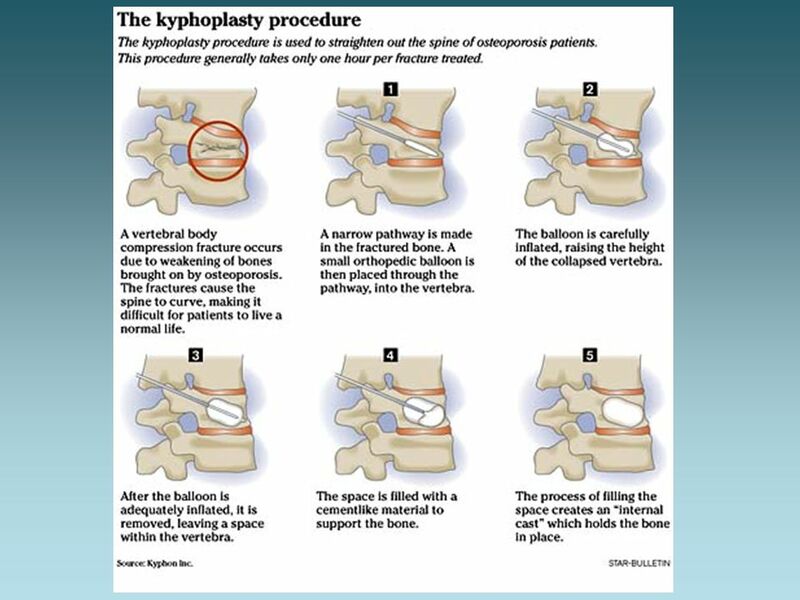 By decreasing reabsorption of bone, a gain in bone density of 5-10% is possible, taking about 2-3 years. 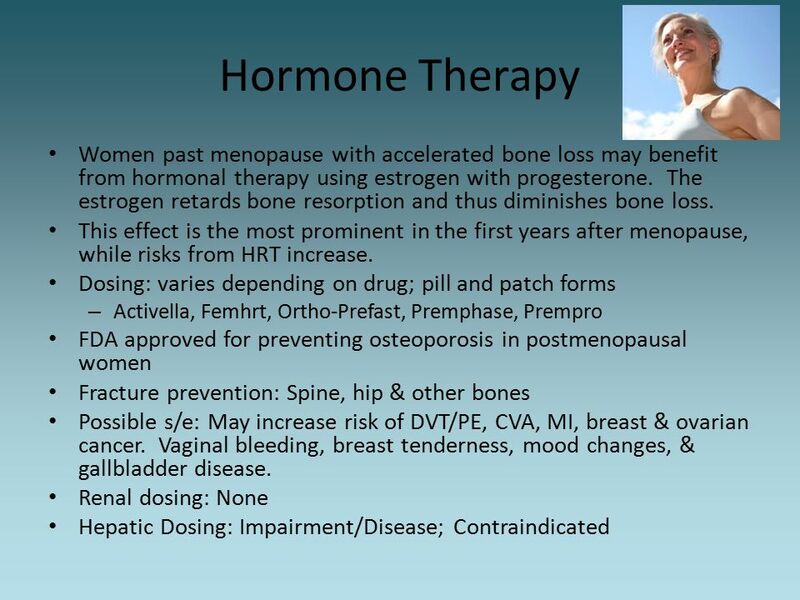 However, no drug therapy will restore bone mass to normal. 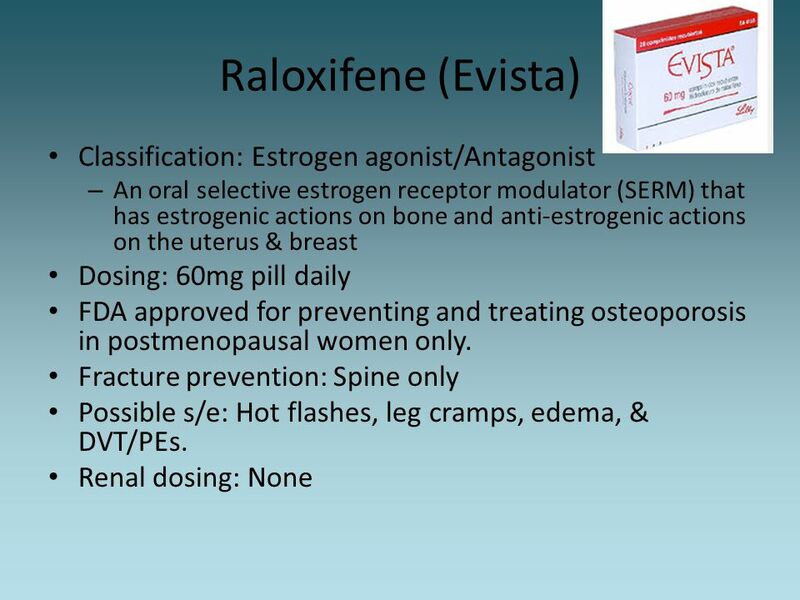 Dosing: 5mg IV every 12 or 24 months FDA approved for preventing (24 mo) and treating (12 mo) osteoporosis in postmenopausal women and men. 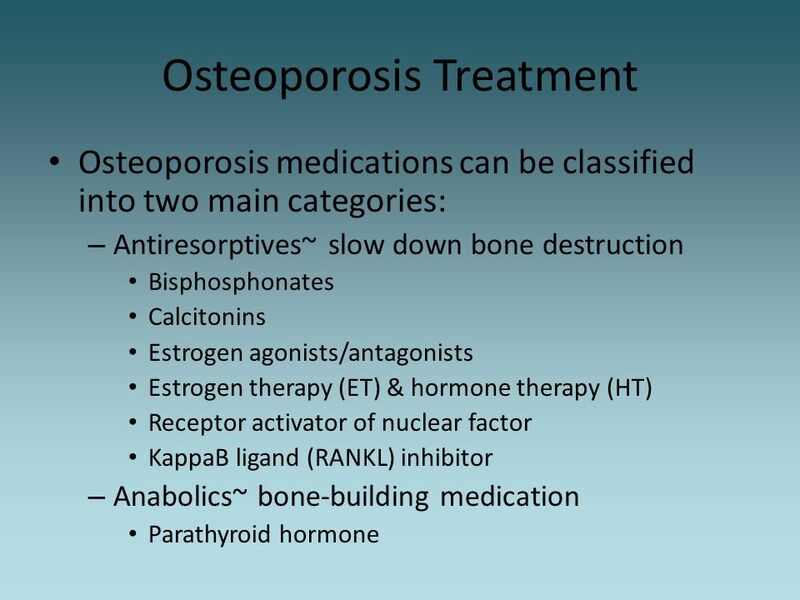 Treating steroid-induced osteoporosis in women and men. 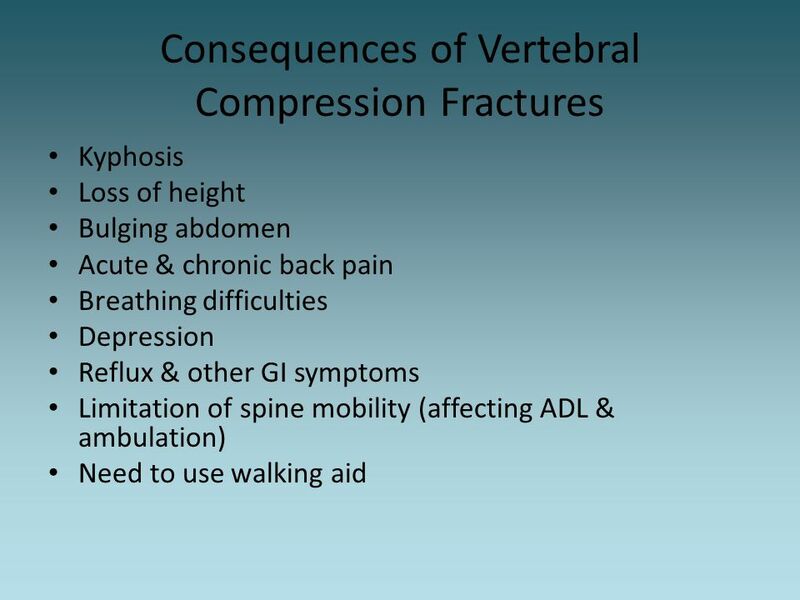 Fracture prevention: Spine, hip & other bones Possible s/e: Joint, bone or muscle pain. 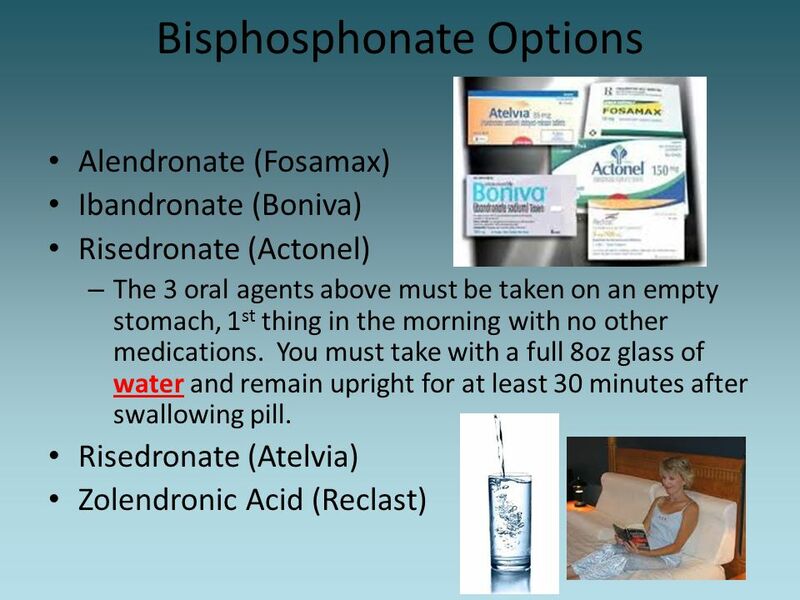 Nausea, reflux, gastritis, or dysphagia. Hypocalcemia, Atrial Fibrillation, AFF, & ONJ. 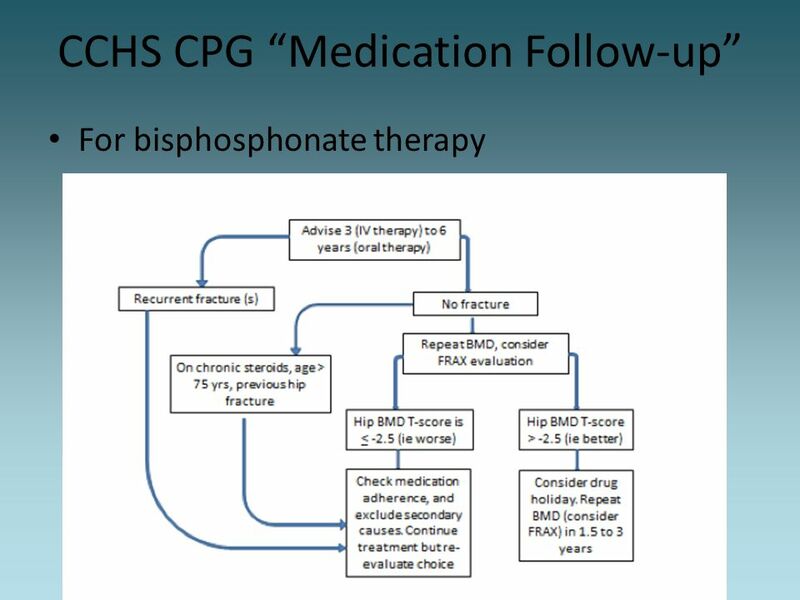 Renal Dosing: CrCl <35; or acute renal impairment contraindicated Tip: If your patient has never been on prior bisphosphonate therapy, they will likely experience flu-like chills & body aches up to hours after their first two infusions. 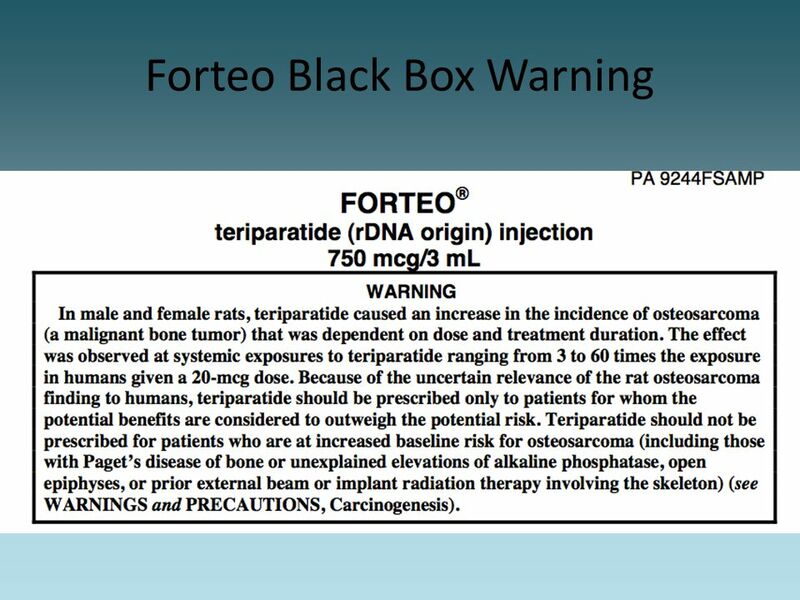 This can easily be treated by taking Tylenol 650mg po every 4-6hrs ATC. 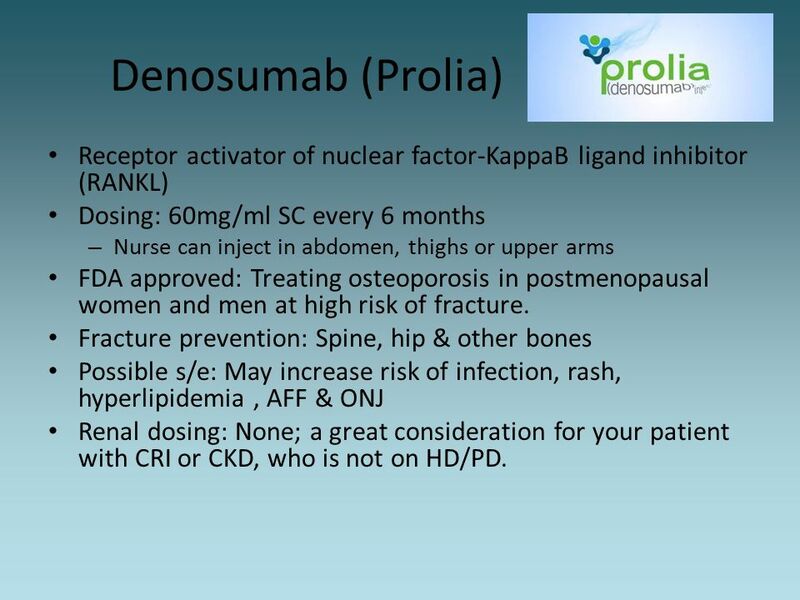 68 Denosumab (Prolia) Receptor activator of nuclear factor-KappaB ligand inhibitor (RANKL) Dosing: 60mg/ml SC every 6 months Nurse can inject in abdomen, thighs or upper arms FDA approved: Treating osteoporosis in postmenopausal women and men at high risk of fracture. 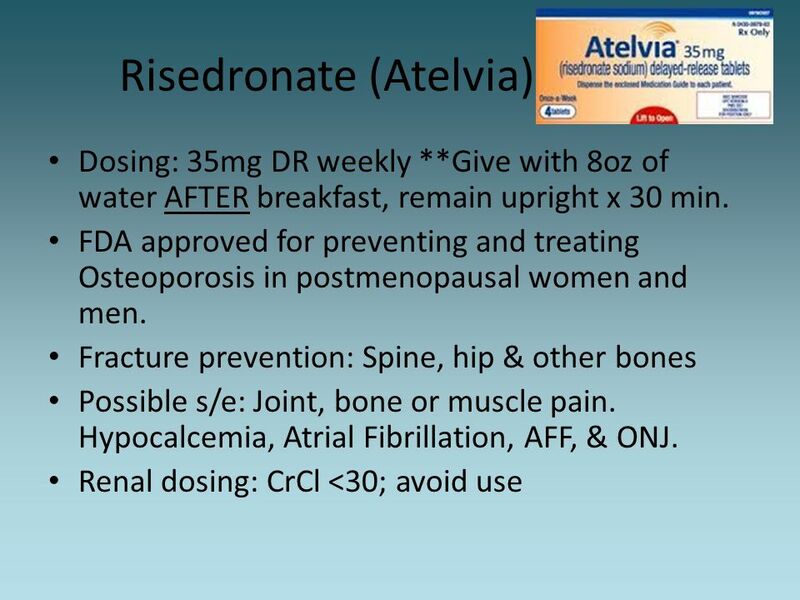 Fracture prevention: Spine, hip & other bones Possible s/e: May increase risk of infection, rash, hyperlipidemia , AFF & ONJ Renal dosing: None; a great consideration for your patient with CRI or CKD, who is not on HD/PD. 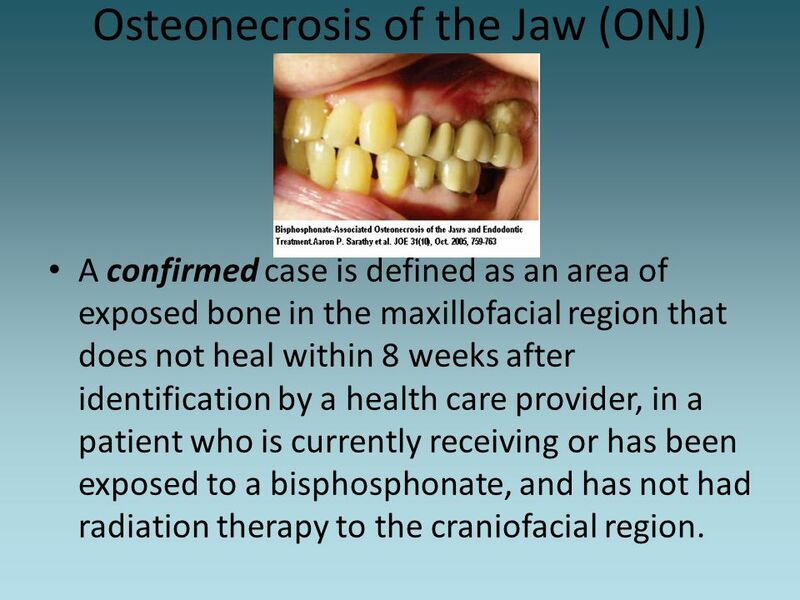 A confirmed case is defined as an area of exposed bone in the maxillofacial region that does not heal within 8 weeks after identification by a health care provider, in a patient who is currently receiving or has been exposed to a bisphosphonate, and has not had radiation therapy to the craniofacial region. 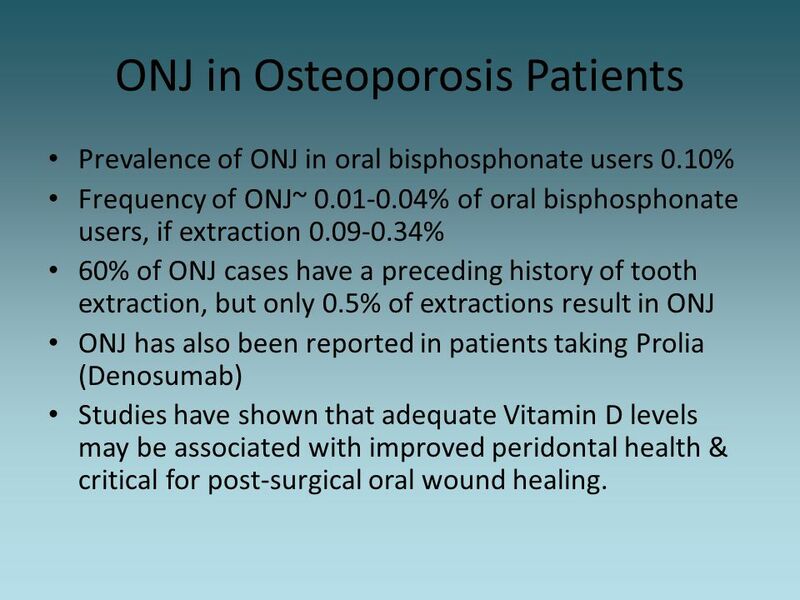 Prevalence of ONJ in oral bisphosphonate users 0.10% Frequency of ONJ~ % of oral bisphosphonate users, if extraction % 60% of ONJ cases have a preceding history of tooth extraction, but only 0.5% of extractions result in ONJ ONJ has also been reported in patients taking Prolia (Denosumab) Studies have shown that adequate Vitamin D levels may be associated with improved peridontal health & critical for post-surgical oral wound healing. 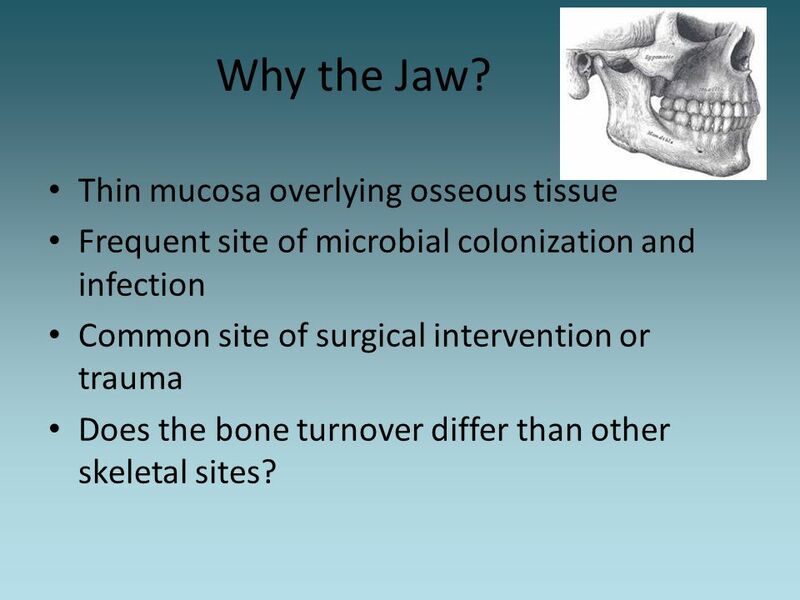 Frequent site of microbial colonization and infection Common site of surgical intervention or trauma Does the bone turnover differ than other skeletal sites? 73 y.o. 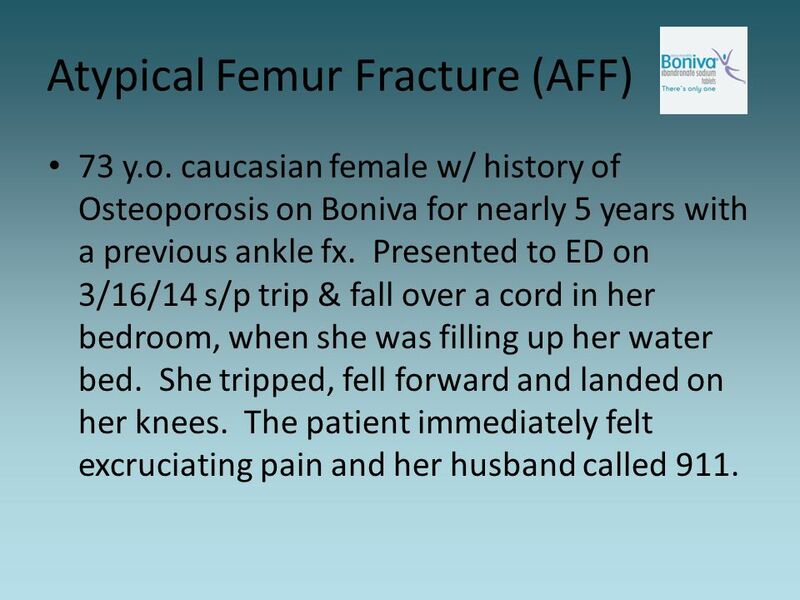 caucasian female w/ history of Osteoporosis on Boniva for nearly 5 years with a previous ankle fx. Presented to ED on 3/16/14 s/p trip & fall over a cord in her bedroom, when she was filling up her water bed. She tripped, fell forward and landed on her knees. 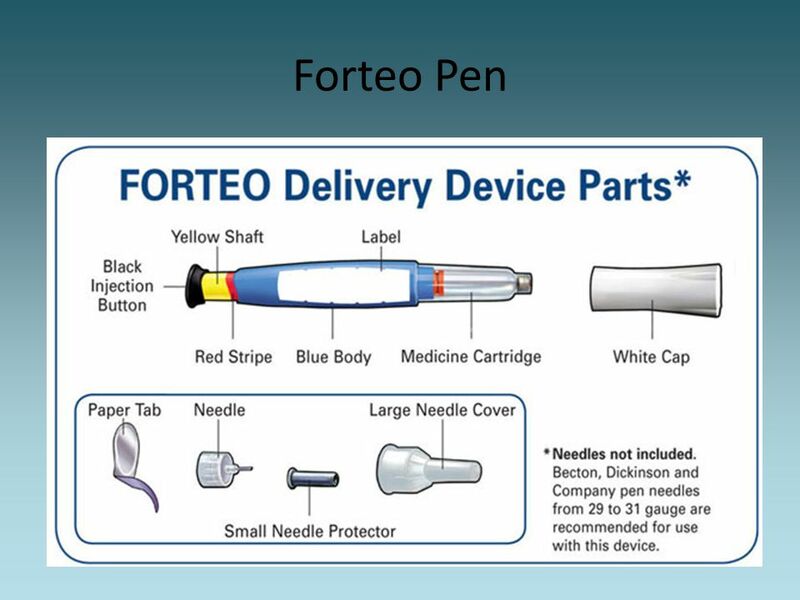 The patient immediately felt excruciating pain and her husband called 911. 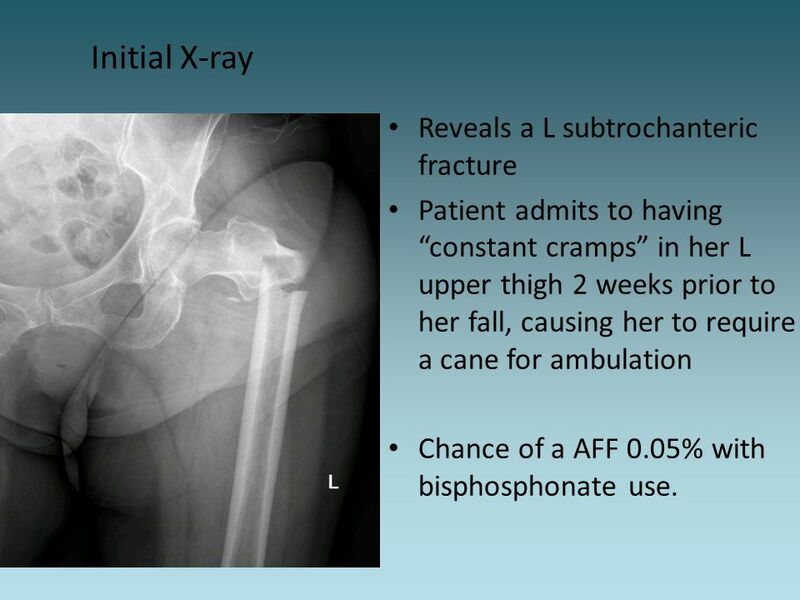 Patient admits to having “constant cramps” in her L upper thigh 2 weeks prior to her fall, causing her to require a cane for ambulation Chance of a AFF 0.05% with bisphosphonate use. 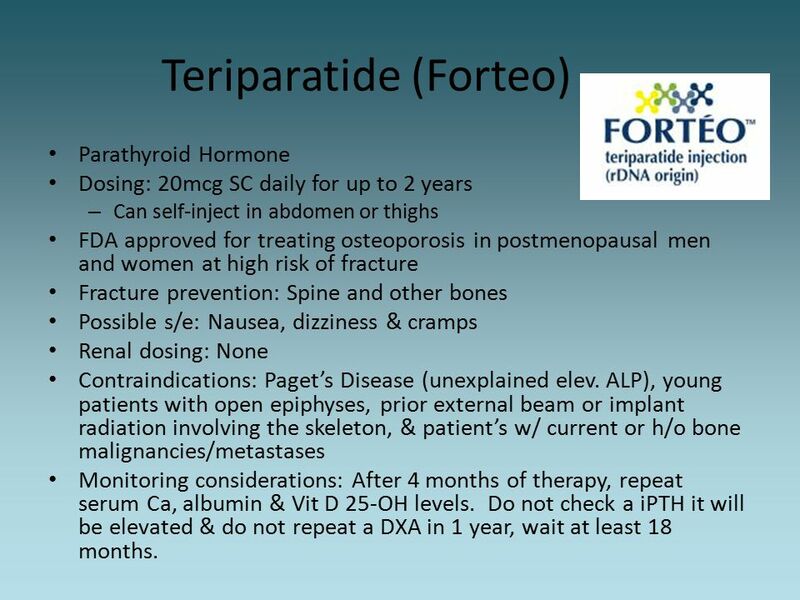 Parathyroid Hormone Dosing: 20mcg SC daily for up to 2 years Can self-inject in abdomen or thighs FDA approved for treating osteoporosis in postmenopausal men and women at high risk of fracture Fracture prevention: Spine and other bones Possible s/e: Nausea, dizziness & cramps Renal dosing: None Contraindications: Paget’s Disease (unexplained elev. 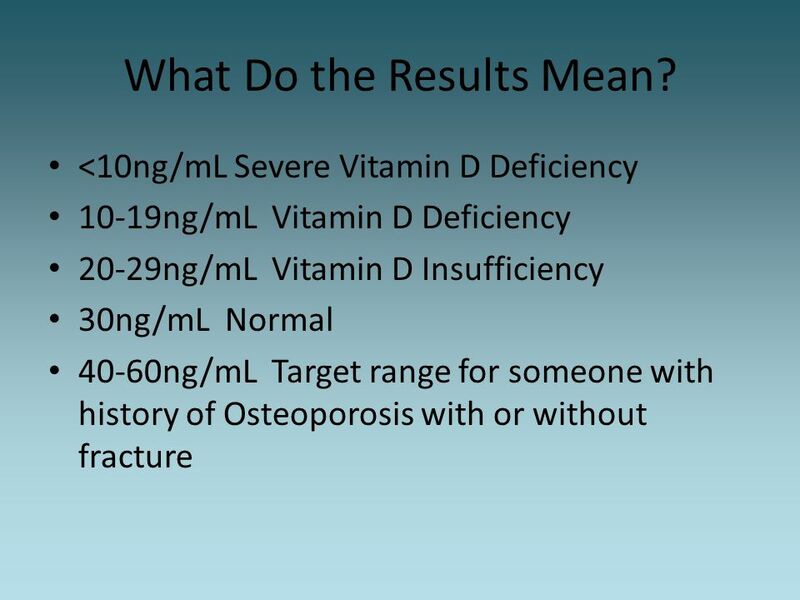 ALP), young patients with open epiphyses, prior external beam or implant radiation involving the skeleton, & patient’s w/ current or h/o bone malignancies/metastases Monitoring considerations: After 4 months of therapy, repeat serum Ca, albumin & Vit D 25-OH levels. 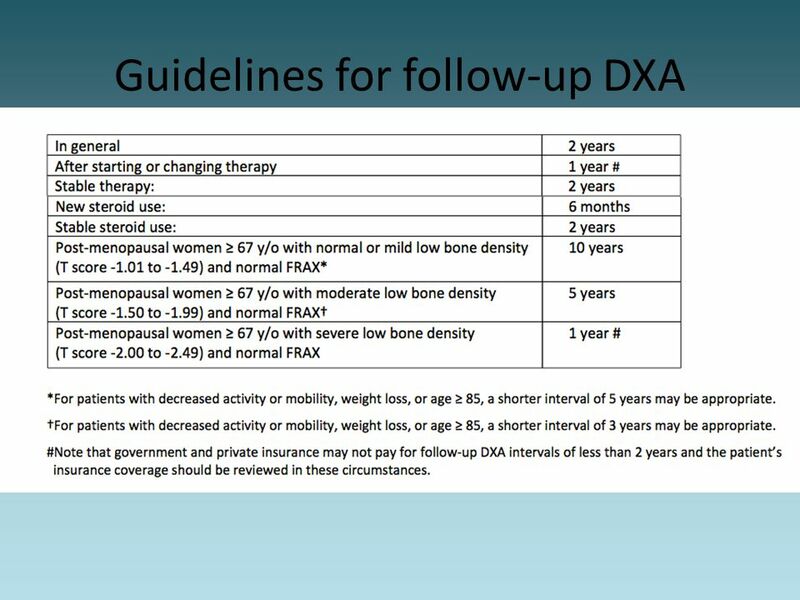 Do not check a iPTH it will be elevated & do not repeat a DXA in 1 year, wait at least 18 months. 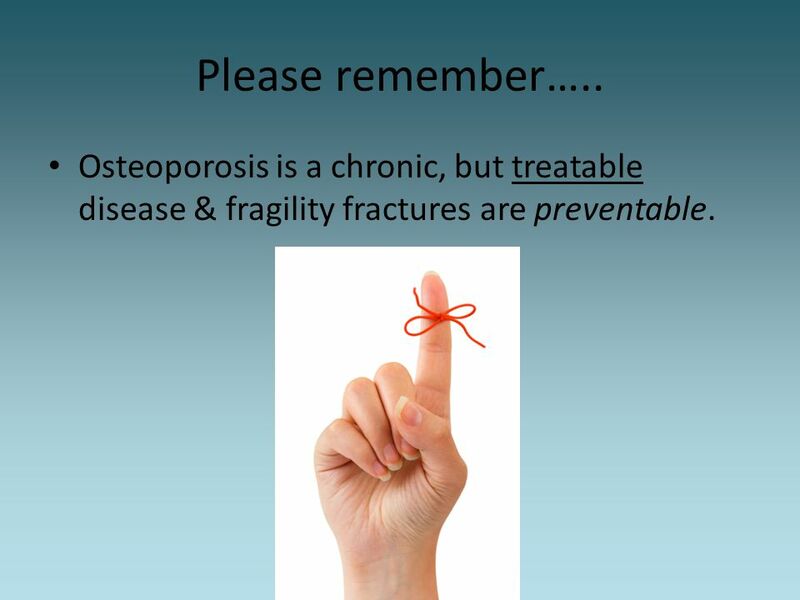 89 Please remember….. Osteoporosis is a chronic, but treatable disease & fragility fractures are preventable. 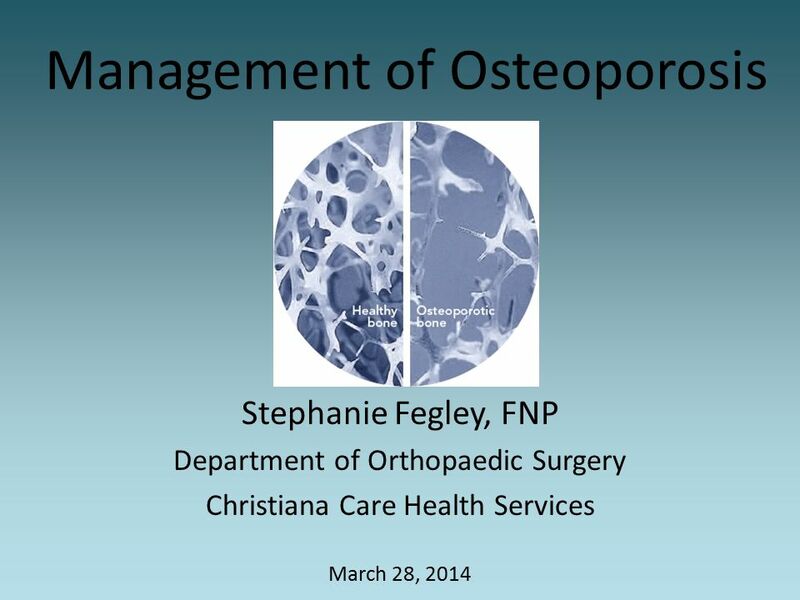 Download ppt "Management of Osteoporosis"
Osteoporosis Metabolic Bone Disease. 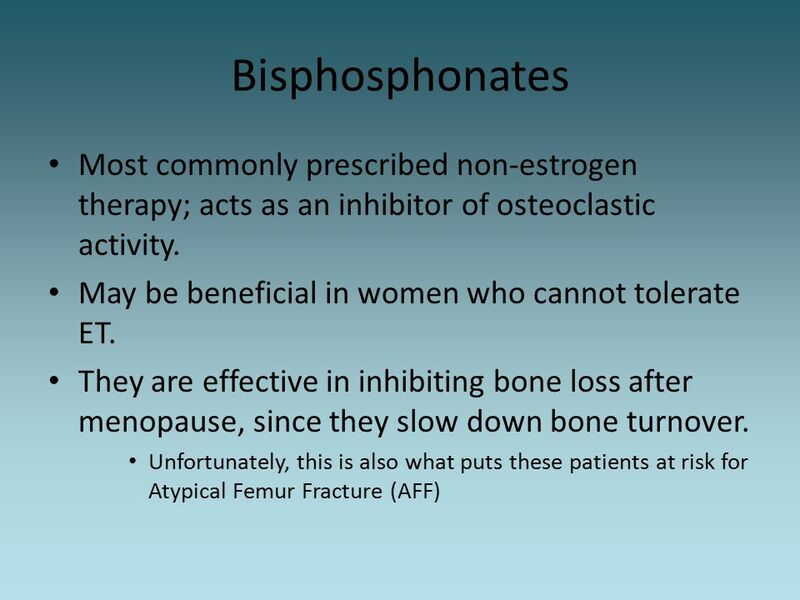 Osteoporosis Characterized by low bone mass and structural deterioration Normal homeostatic bone remodeling is altered. 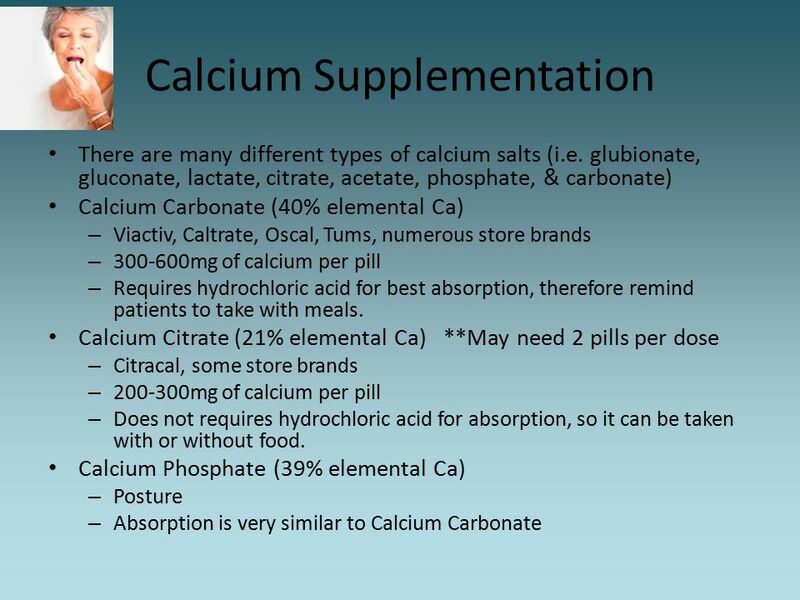 Importance of calcium: Ca ++ regulates: Neural function Muscle contraction Secretion of some hormones Blood clotting. 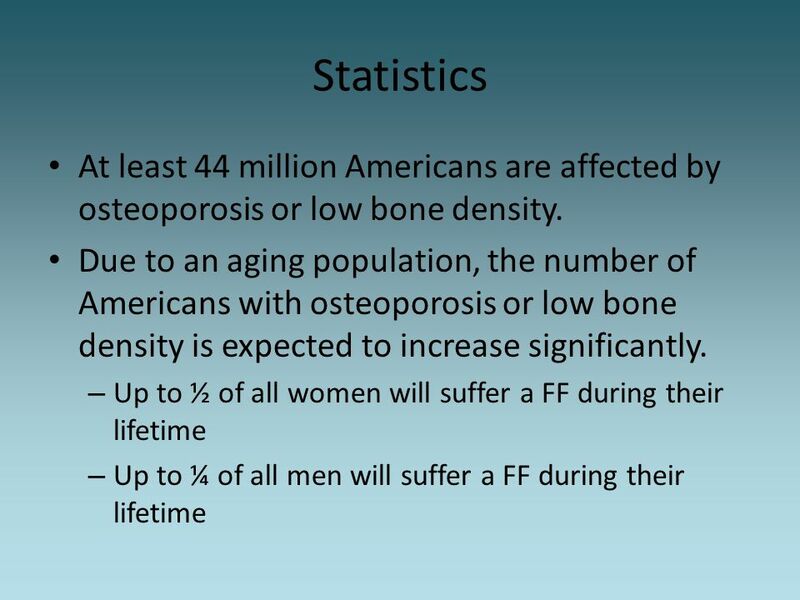 © Food – a fact of life 2009 Bone health through life Extension. 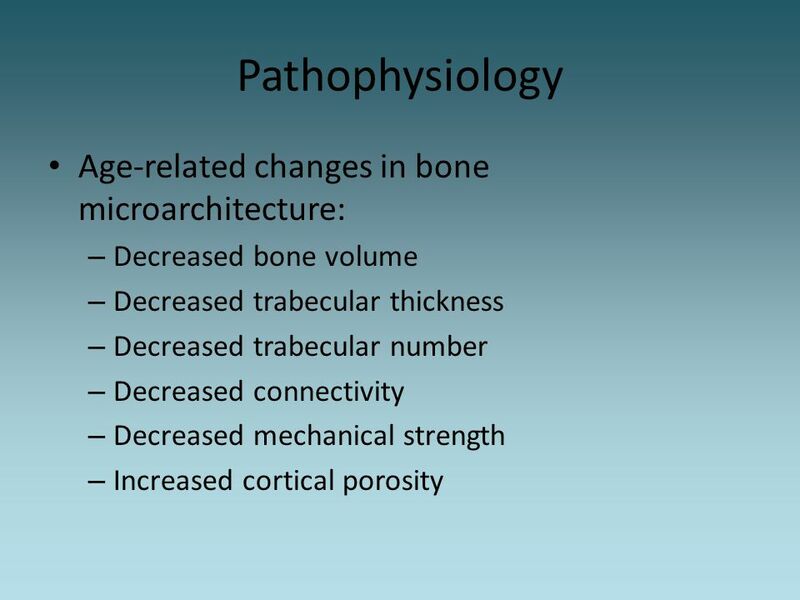 What You Need to Know for Better Bone Health. A quick lesson about bones: Why healthy bones matter The healthier your bones The more active you can be. 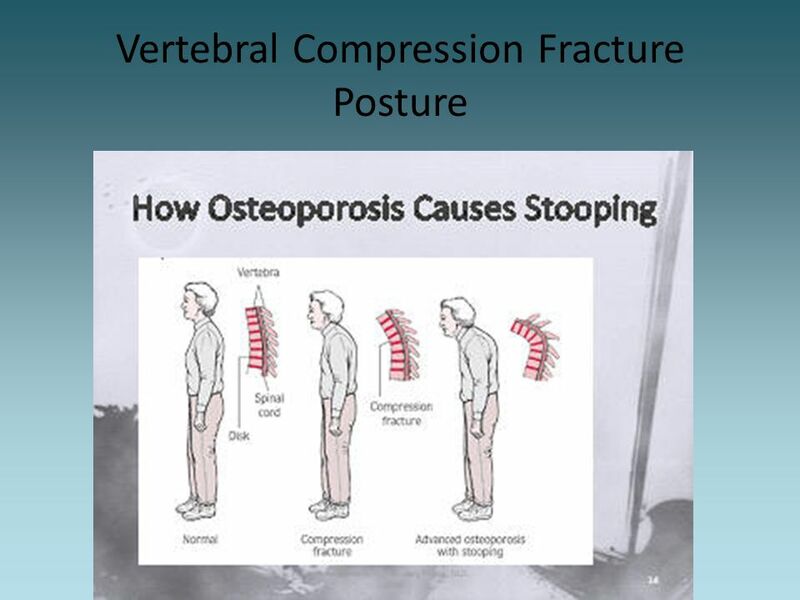 UNDERSTANDING OSTEOPOROSIS Stephen L. Kates, MD Hansj ӧ rg Wyss Professor of Orthopaedic Surgery Department of Orthopedics and Rehabilitation Associate. 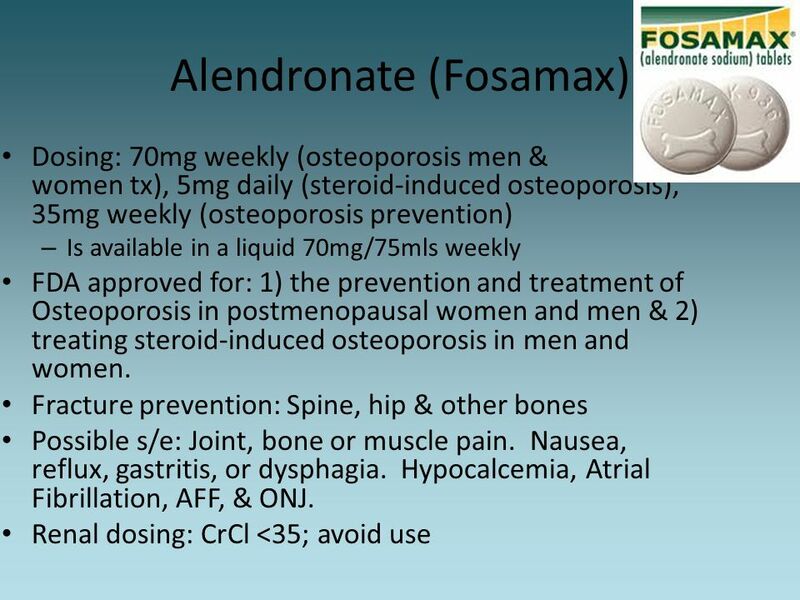 Osteoporosis Osteoporosis is defined as a loss of bone mass or bone mineral density characterized by height reduction, fractures, back/neck pain, and stooped. Bone Up on Health. 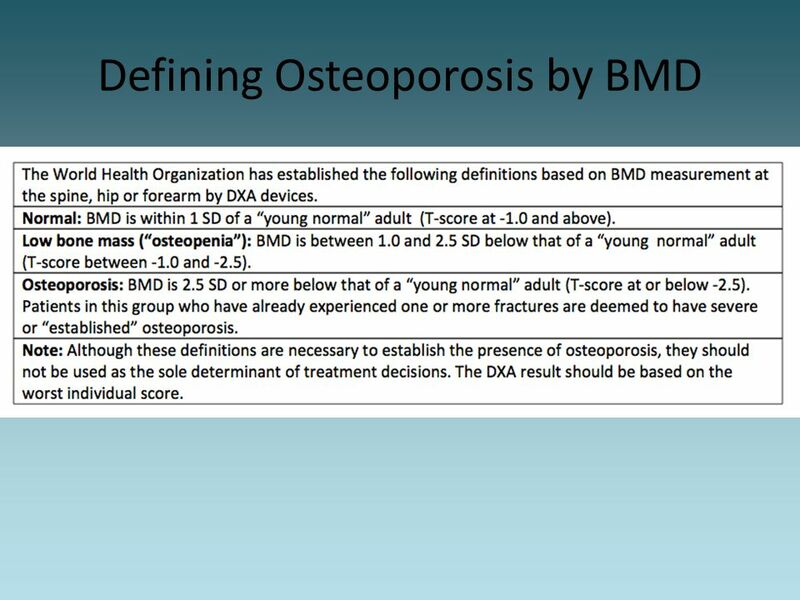 Objectives Define osteoporosis and why it is a problem. 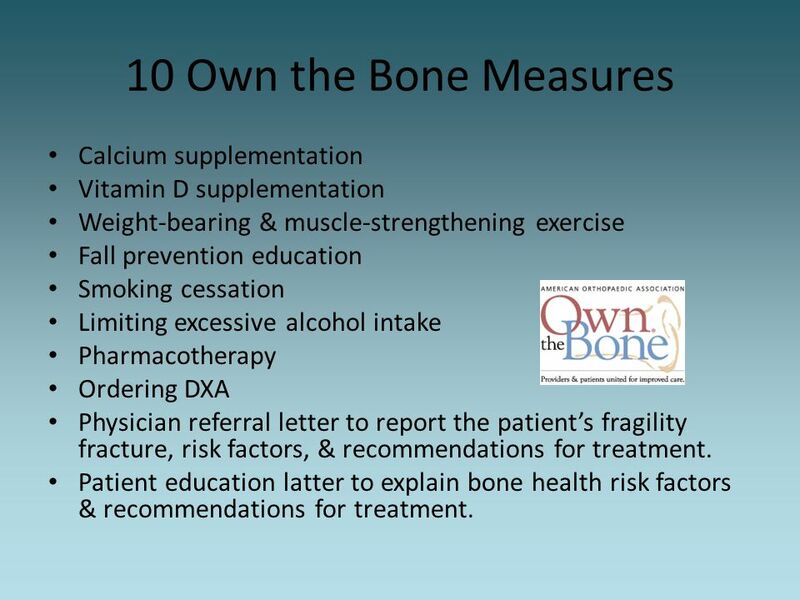 Discuss the importance of knowing your bone health. 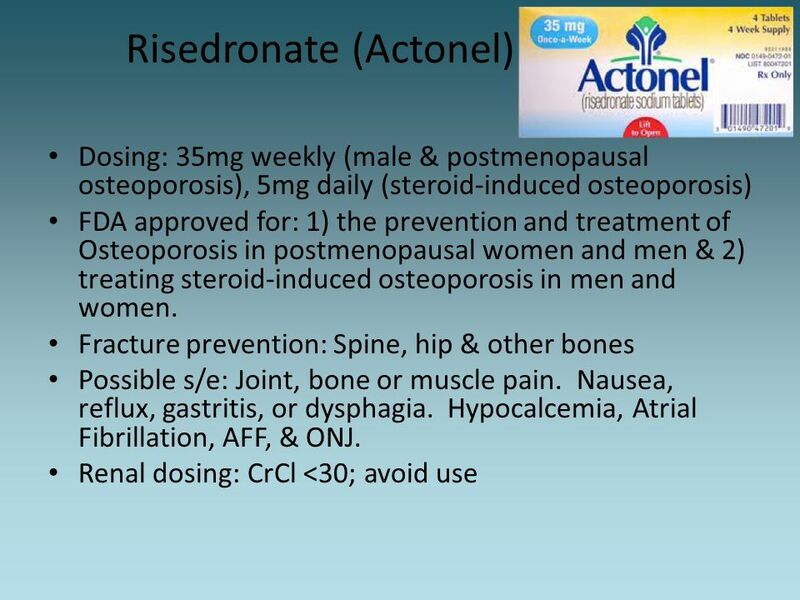 Discuss osteoporosis prevention.